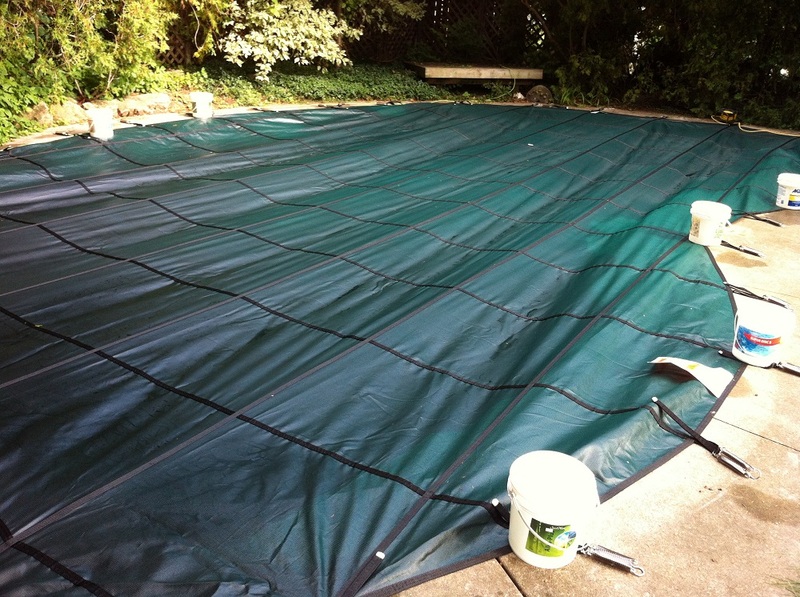 Installing a safety cover on a pool is something that most do-it-yourself enthusiasts should be able to accomplish. This process does require the use of some heavier tools, such as small hammer drill for easier installations, and more complex installations can potentially require sledgehammers, grinders and a much larger hammer drill. 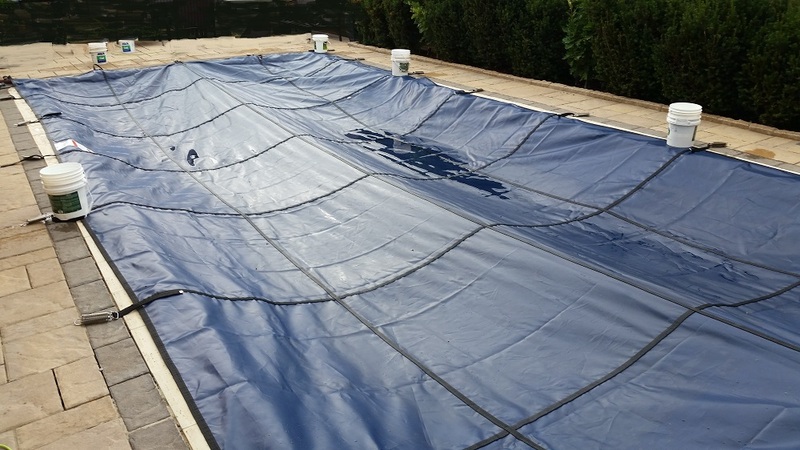 If you are not afraid of a little labor and have the ability to take fairly precise measurements then you can easily install your own cover. 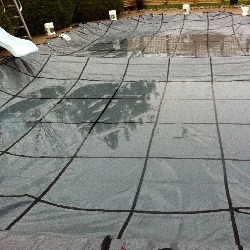 Why would you want to install your own pool safety cover? - The simple answer to this is to save money. 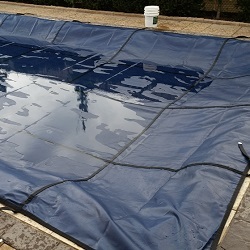 To have a pool professional sell you a cover we need to come to your house, take measurements, write up the order, send it in, cash your deposit, pick up the cover, come to your house and install it, answer your questions and finally cash the balance payment. On an average safety cover installation you would be looking at anywhere from $500 to $1500 in fees you are paying for these services. 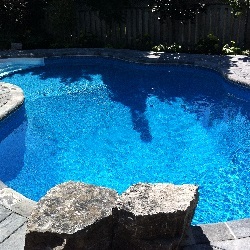 With a little instruction anyone can measure a pool for a safety cover and installing takes less than one day (2-3 hours for a professional). 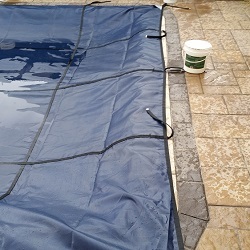 Installing a safety cover is actually one of the easier pool projects compared to installing a new liner, installing pumps, filters or heaters, finding leaks, fixing tile etc. and can really make getting a new safety cover more affordable for you. 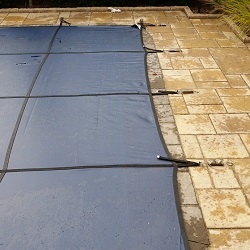 This is an example of the difference between lock in covers that connect into a coping track around the top of the pool wall versus a pool safety cover that is a spring loaded cover that spans flat over the top of the pool and connects into the pool deck with anchors that are drilled into place. 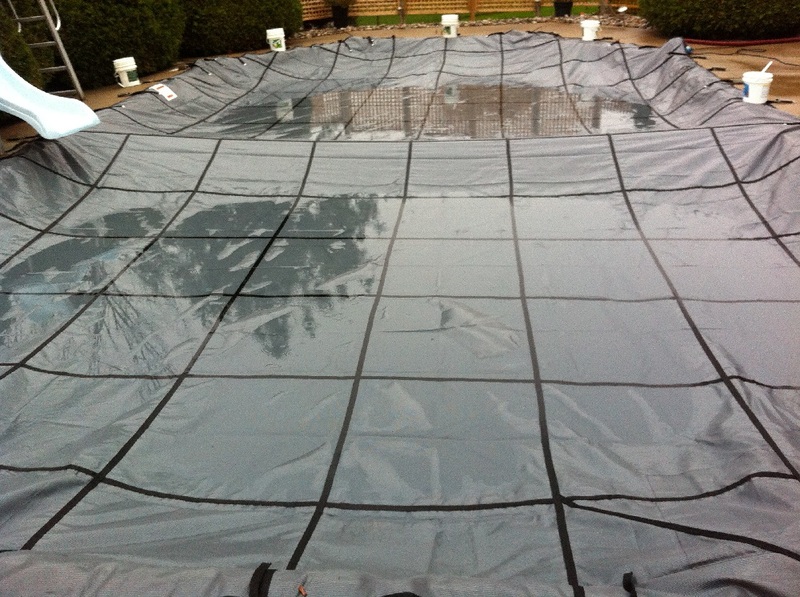 Safety covers are not intended for day to day use securing the pool area - they are for extended periods of time where the pool will be closed such as with winterization. 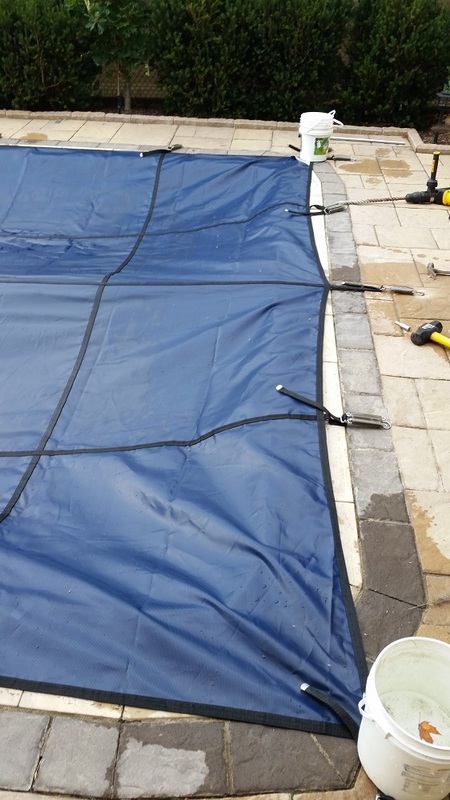 A brass grommet is drilled into the pool deck, with specific hardware options for installing anchors into any type of deck surface - concrete, interlock stones, grass and gardens as well as hardware for connecting to waterfalls or water features that encroach onto the pool edge. Using a leverage bar tool the cover is put under spring tension by a series of heavy duty springs that are connected to straps on every seam. 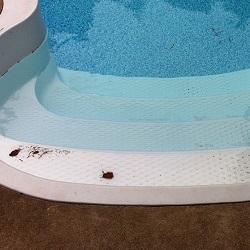 During the swimming season the grommets tighten flush with the deck. 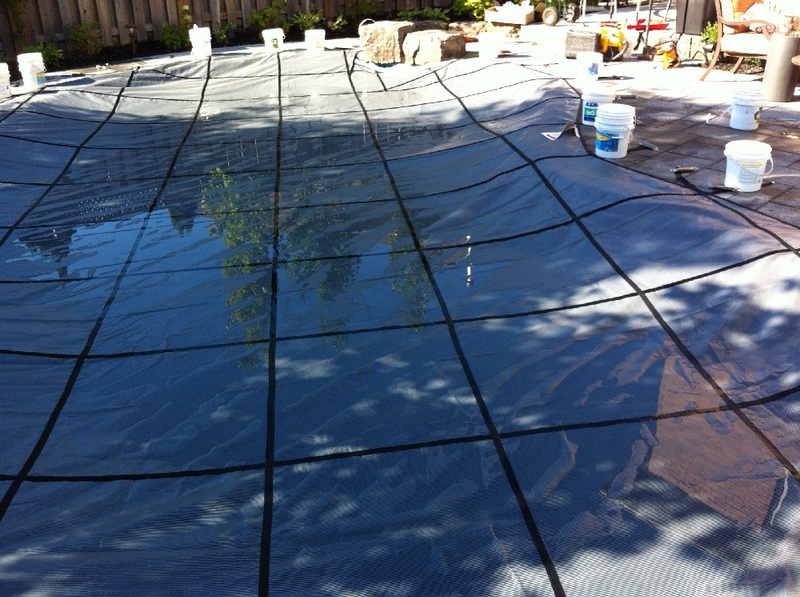 Shape of the pool - Pools that are made up of entirely straight lines and are symmetrical will be the easiest to install. 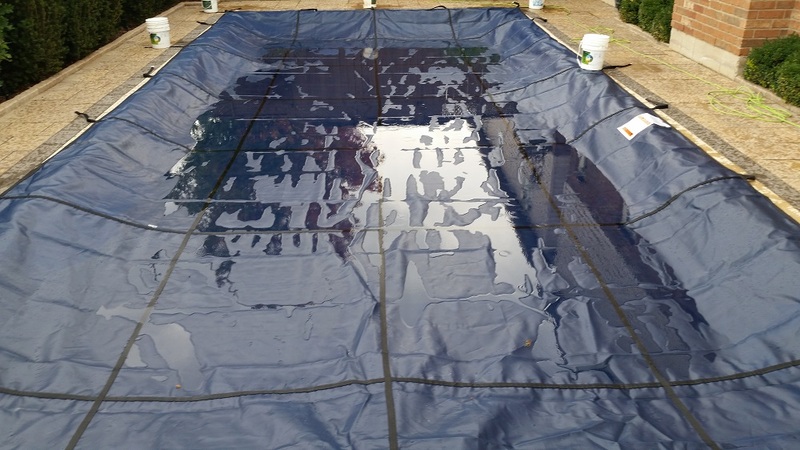 If the pool has any rounded edges or asymmetry this will increase both the cost and difficulty of installing your own cover. 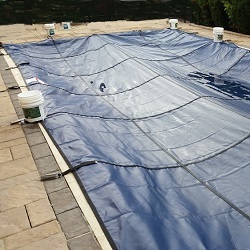 A rectangle pool would be an example of an easy cover, and one that would be much less expensive since it is a standard shape. 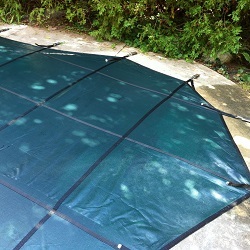 This is referred to as an "off the shelf" pool cover and will come in standard sizes. 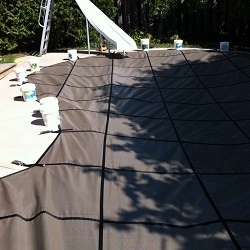 Order the size for your pool and you are ready to install it. 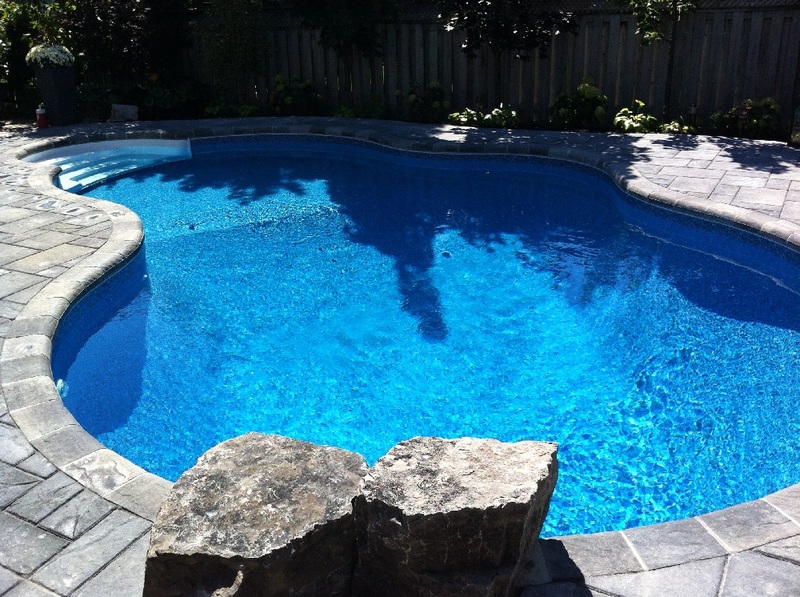 If the pool has any asymmetry, radius walls or curves of any kind, then this is called a freeform pool and will require a custom cover measurement. 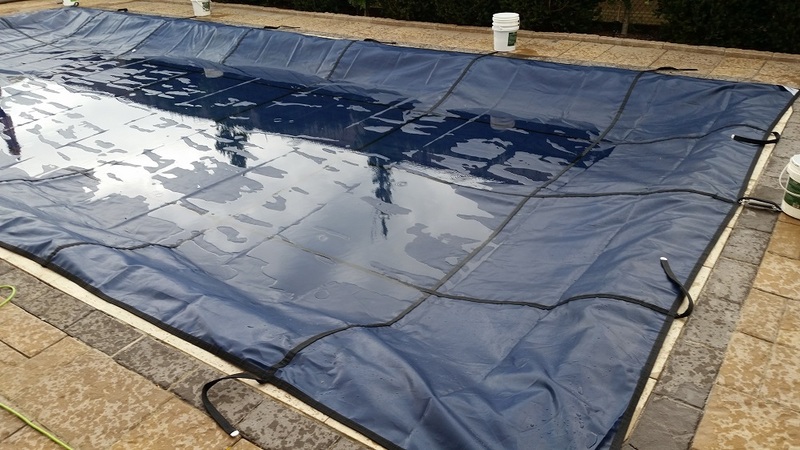 A custom cover will cost significantly more than an off the shelf cover, and you will need to be able to perform an A-B plot measurement of the pool. 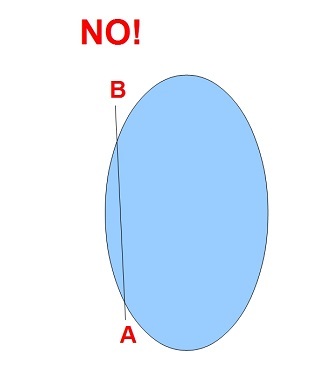 An A-B plot is not necessarily hard, but much more difficult than measuring the length and width of a rectangle. Type of deck material - The standard for "easy" safety cover installations is any type of concrete. 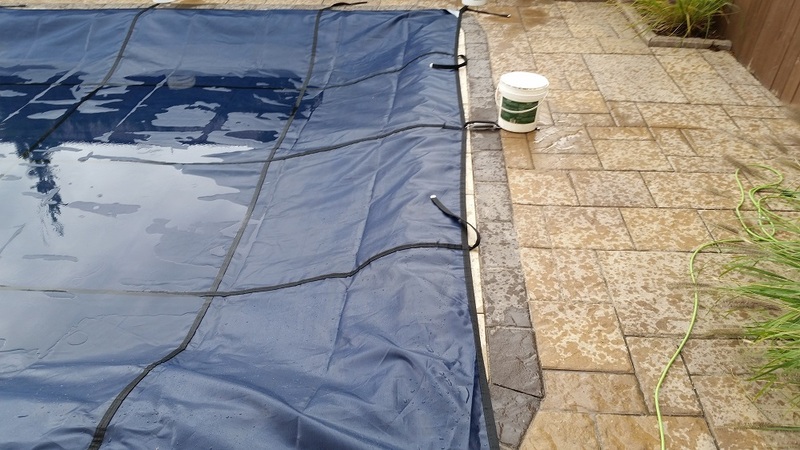 Concrete pool decks, whether broomed, stamped or other, are easier to install than any pool with paving stones, interlock brick or any kind of natural stone. 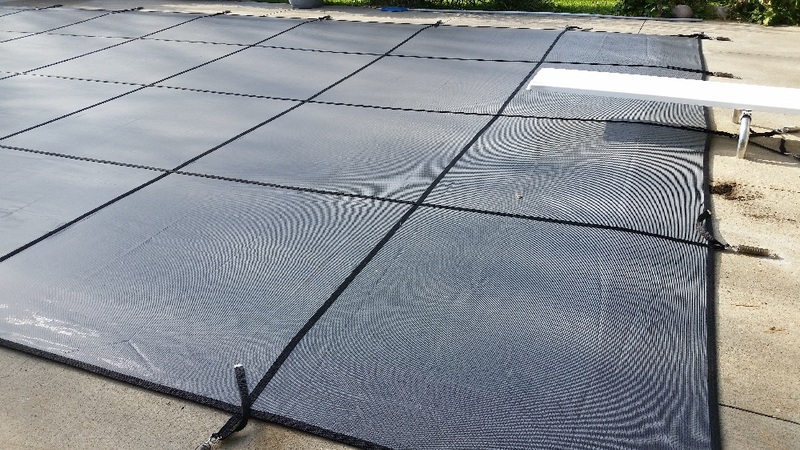 There is also a significant cost difference for the hardware required for installing into a concrete deck versus installing into pavers or stone. It can cost as much as an additional $750 just for hardware upgrades for safety covers installed into something other than concrete. 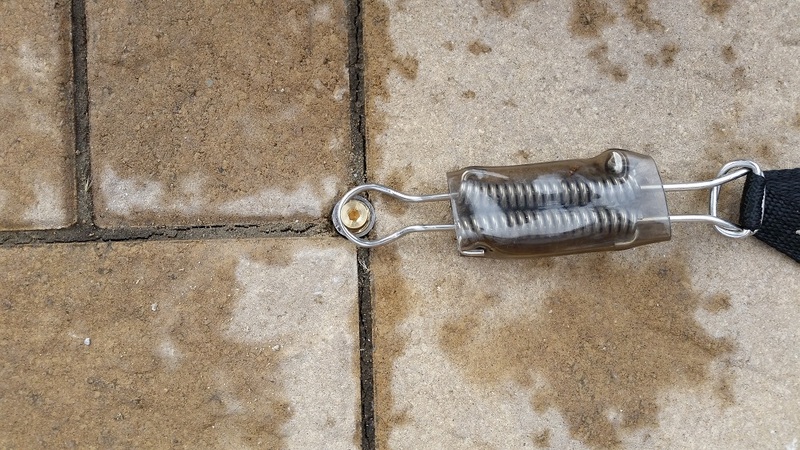 A concrete anchor installs about 1.5" deep into the pool deck with a 3/4" drill bit. Interlock stakes are installed over 12" deep and require a larger 7/8" bit or 1" bit depending on the supplier that you choose. 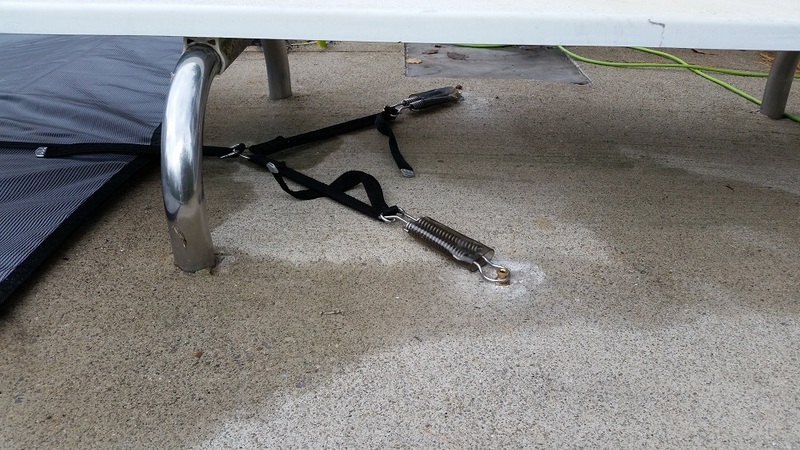 Do not attempt to install concrete anchors into a stone or interlock deck (as many installers did 20 years ago when these covers first hit the market) as this will absolutely damage the pool deck and ultimately make the cover not safe - which defeats the point of it entirely. If you have interlock you may end up needing a sledge hammer and steel grinding disc for if things are not going smoothly, plus the chance to damage the deck exists as cracking stones is a definite possibility. 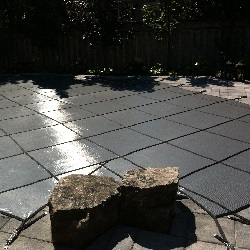 Conservatively, interlock installations are twice as difficult as concrete installations. Intrusions on the pool deck - A pool deck that has no intrusions within 3 feet of the pool edge is ideal from an installation standpoint. 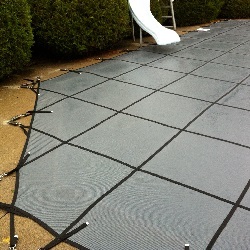 If there is a slide, permanent railing, raised wall, waterfall or diving board base within 24-36" of the pool edge then this may increase both the cost, and difficulty of the installation. Every alteration made to the cover, such as cutouts for slide legs or a diving rock will cost you a few hundred dollars as well as requiring some very careful measuring on your part. 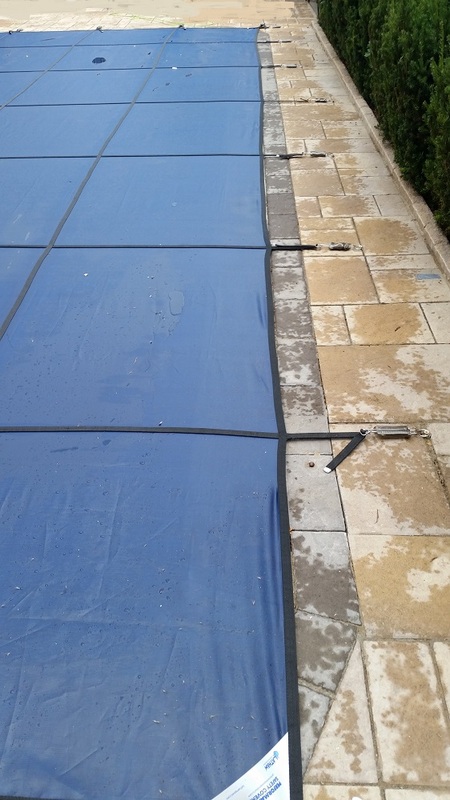 If the cutouts are placed in the wrong area your cover will not fit the pool properly - and returns for alterations to the cover can be costly and time consuming. 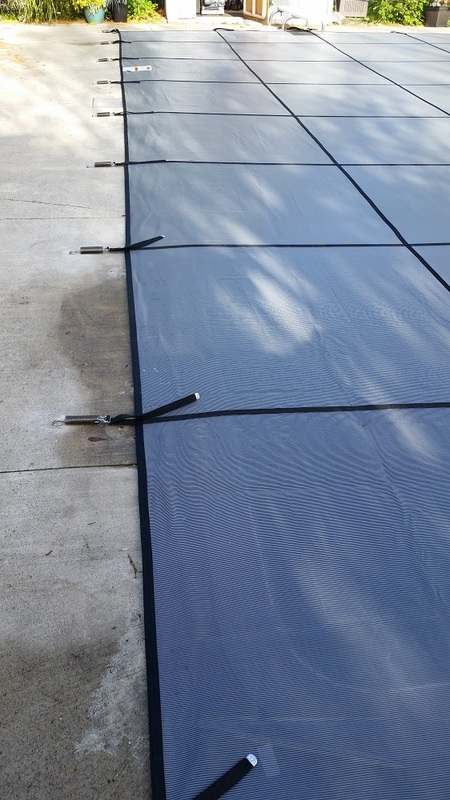 Pool steps - If the pool has in-wall steps that are outside of the perimeter of the pool area this will increase the difficulty and cost of your cover. 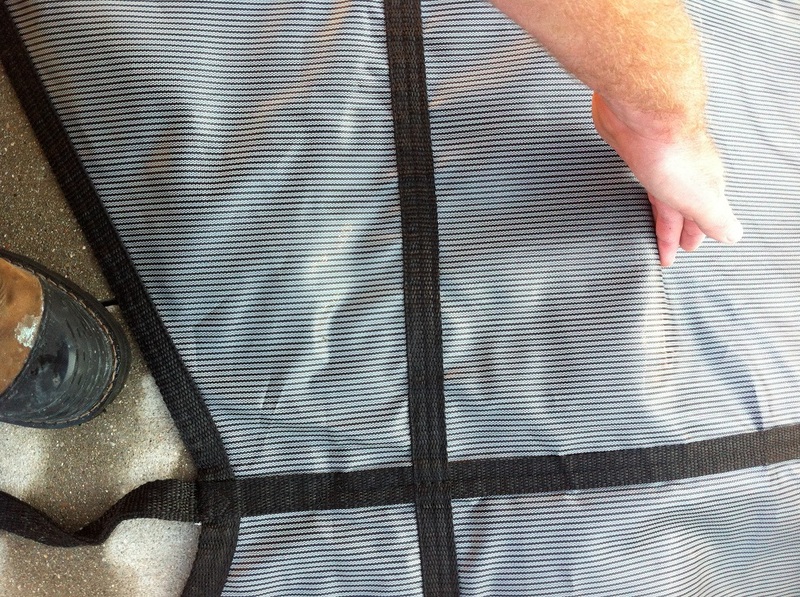 There are a select few off the shelf covers that include step sections of general size and location. 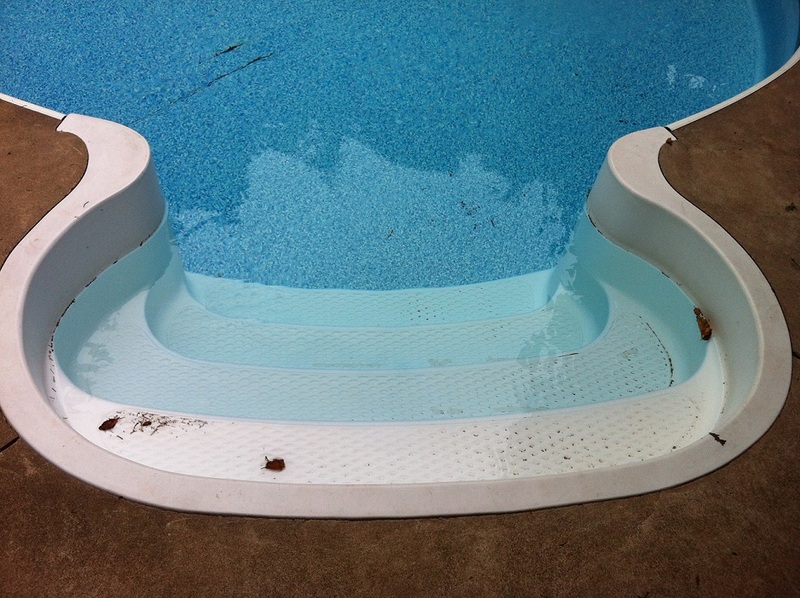 Pool steps are often 4', 6' or 8' wide so sometimes you can get an off the shelf cover that has just what you need. 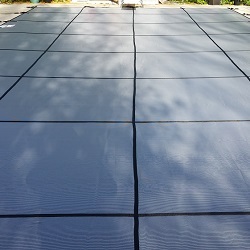 In most cases having steps will require your cover to be custom made which increases the cost and wait time for the cover as well as increasing the difficulty of the measuring process somewhat. 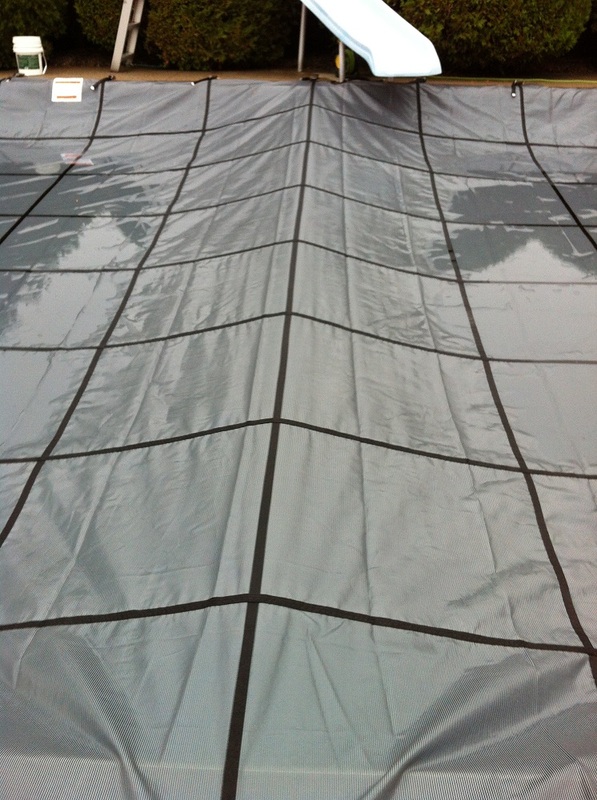 Mesh safety covers are the industry standard for safety covers and make up the vast majority of safety covers on the market. 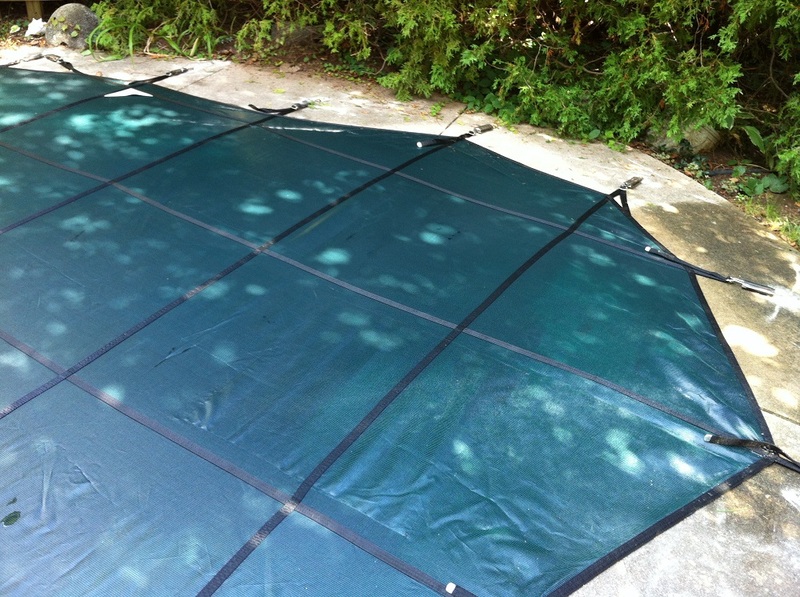 These lightweight covers are easy to clean and store, as well as being a breeze to put on or take off the pool. 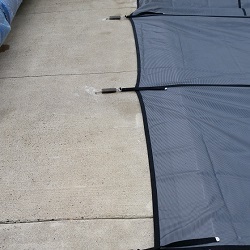 Thin enough to see through the cover from the right angle and in the right light these light duty safety covers were the first ones to reach the market. If you are not sure which cover it is that you should get this is probably the one you are looking for. 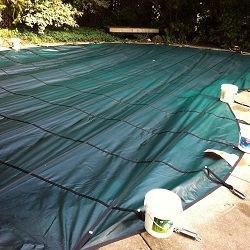 Commonly this cover will let 5% of sunlight into the pool and is sometimes referred to as a 95% cover. 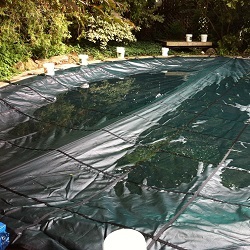 With these covers snow and water will melt through into the pool below but leaves and debris will dry up and blow away. 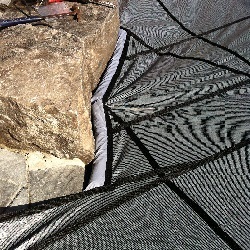 Heavy duty mesh covers are exactly the same as the lighter mesh material except thicker and heavier. 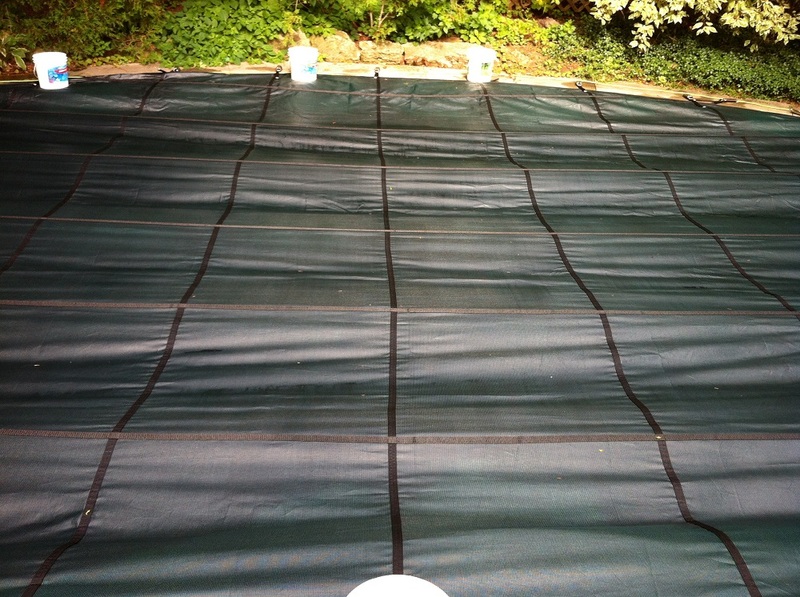 Commonly allowing only 1% of light into the pool these covers are sometimes referred to as 99% covers. 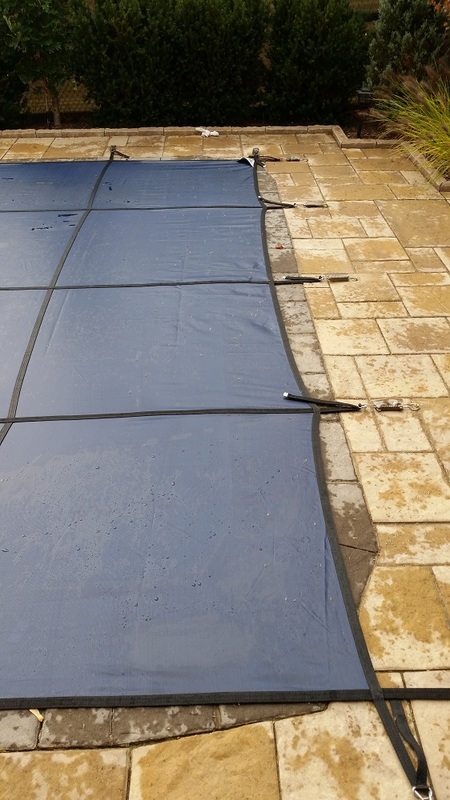 Water will still drain through as with the lighter material - these covers simply are thicker and more durable (and more expensive). 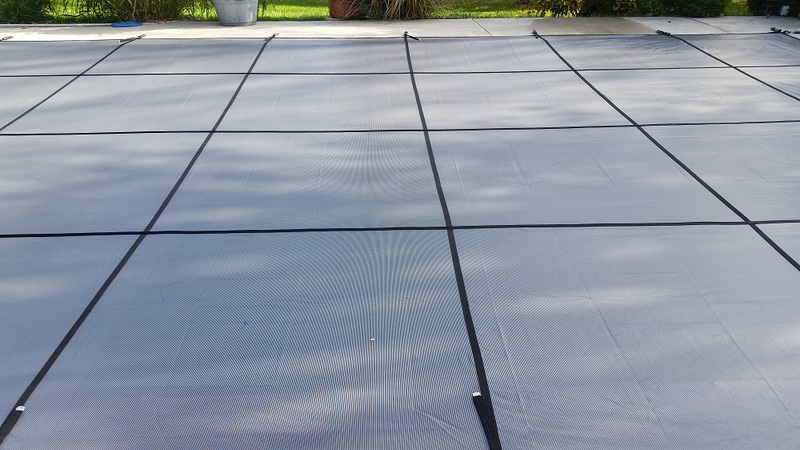 Solid safety covers are not a mesh material but instead a solid material designed to prevent 100% of light from reaching the pool. 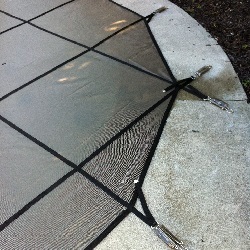 Solid safety covers also have a mesh screen (and usually filter) for allowing some water to enter the pool. 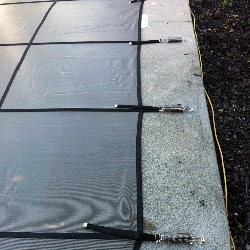 This will prevent too much water from standing on the cover and destroying the hardware (springs and grommets). 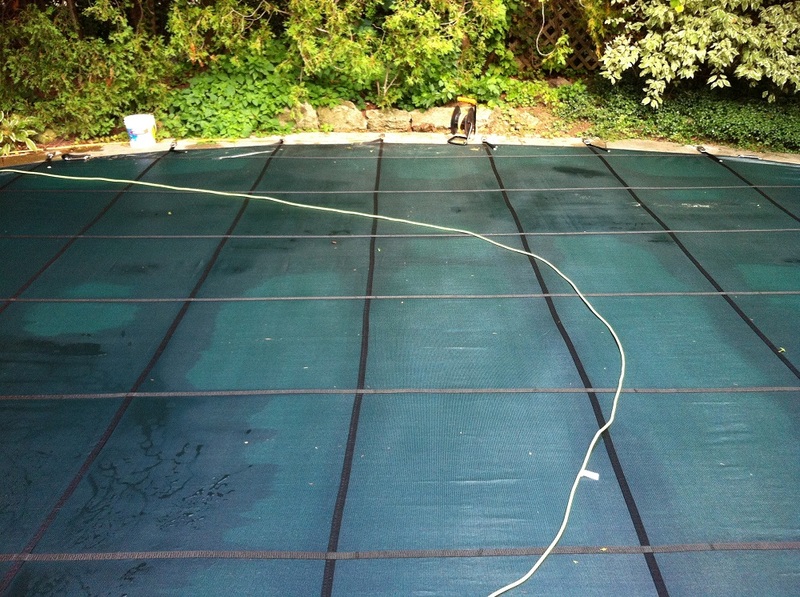 So which cover is the right choice for your pool? Well that will depend on what your priorities are. 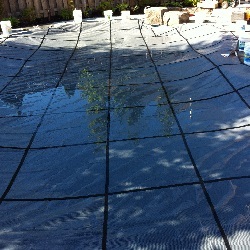 A mesh safety cover protects the pool from children or pets being able to fall in. It also stops leaves from falling in. 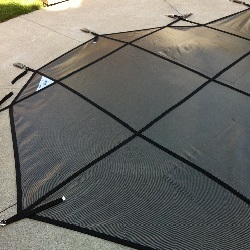 If that is what you are looking for then the basic mesh cover will do. 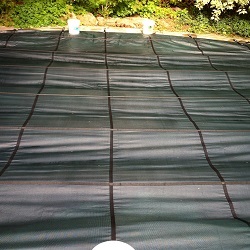 You will have silt in the pool in the spring, and the cover is light duty so if you were to walk out on it you will end up getting wet up to the knees as it will bow under your weight - but none of the covers are actually meant to be walked on. 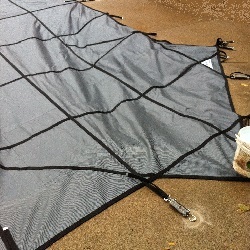 A heavy duty mesh cover is good for backyards with lots of falling branches and debris. 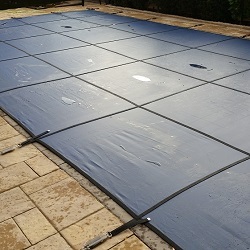 It will withstand greater for punctures and tears as well as allow less debris to get blown into the pool from underneath the edges of the cover. 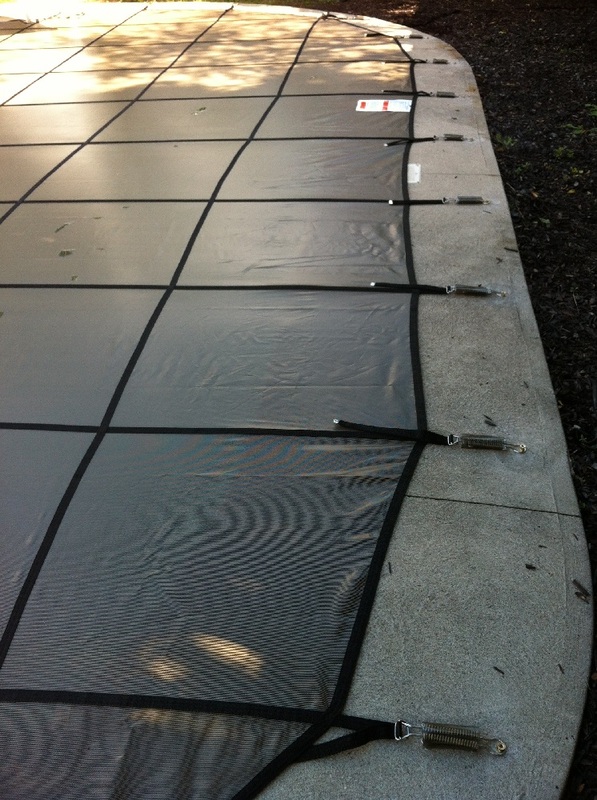 Heavy duty mesh covers will typically also carry a longer warranty from the manufacturer. 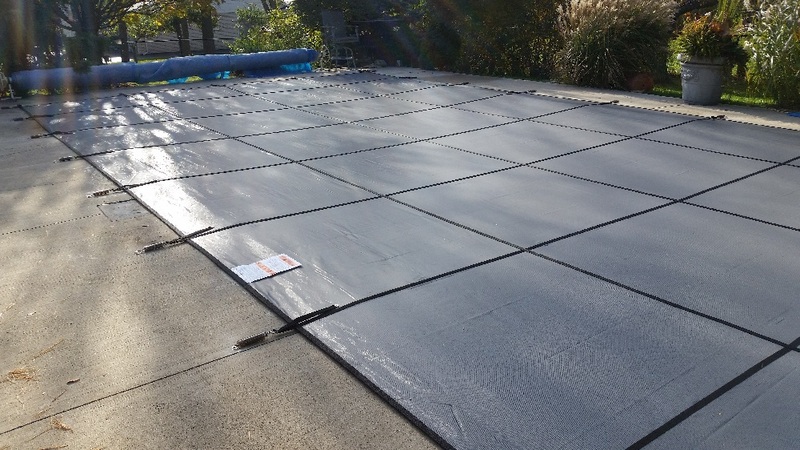 A solid cover is overkill for most pools but if you are looking for the absolute maximum level of protection for the pool (and for the people around the pool) then a solid cover is the best. 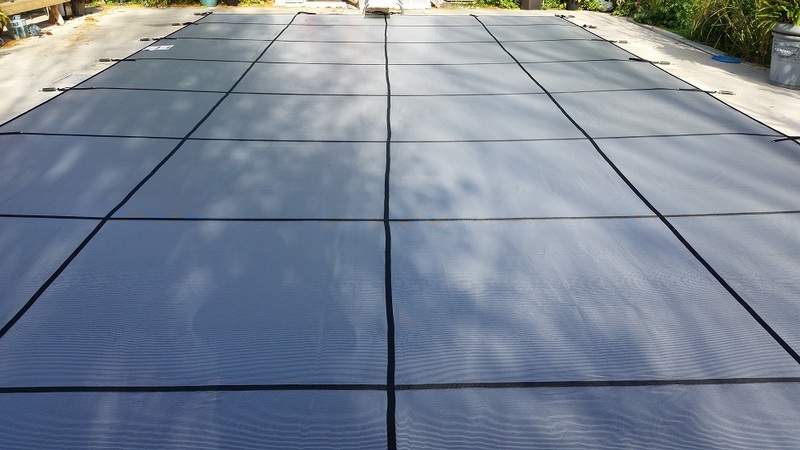 They are heavy, hard to install, difficult to store and cost a lot more money than mesh covers - but if you want your backyard area secure and your pool protected, a solid cover is a good choice. 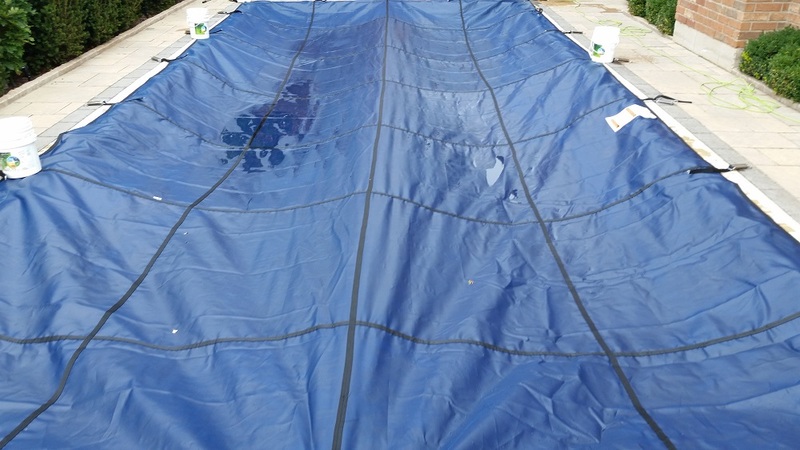 There are two different kinds of safety cover measurement that can be done and the one that you will need to use will depend completely on the shape of the pool that you have. 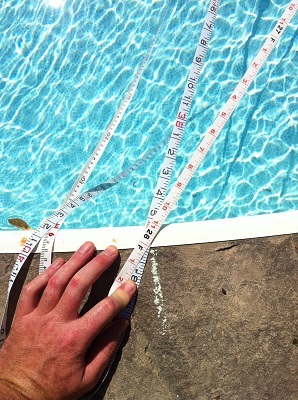 Only a few pool shapes are simple enough that you can get away with a single tape measurer and some linear measurements. 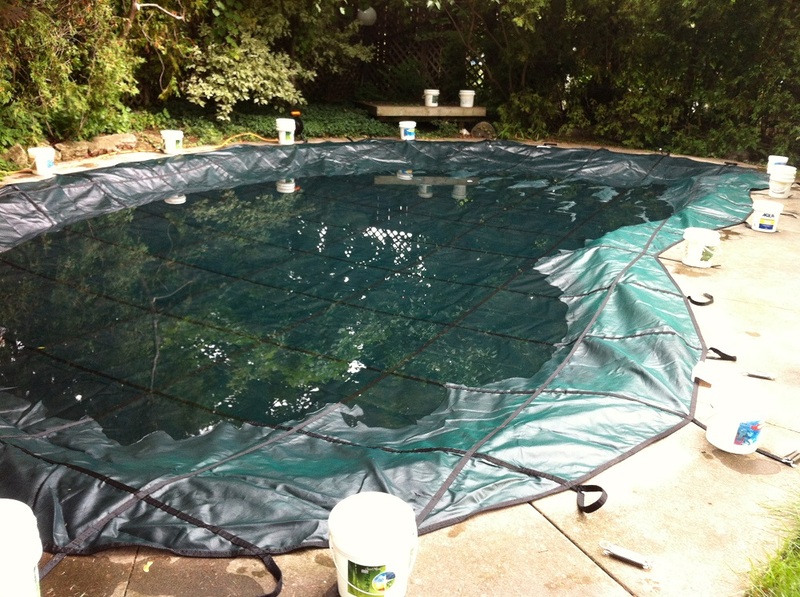 Most pools will require an A-B plot measurement which is used to create a custom cover for your pool. Certain manufacturers may have specific measurement guidelines that you will need to meet however most will follow a very similar process. 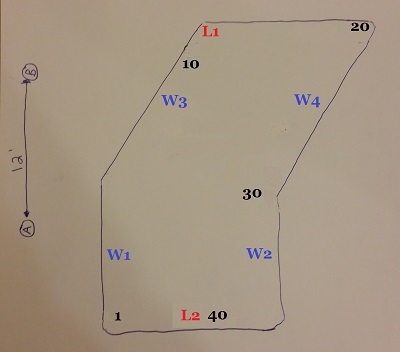 The process of measuring an A - B plot for a new pool cover involves measuring to certain points around your pool from two different reference points known as "A" and "B". These two reference points must be a minimum of 10' away from each other and both should be a minimum of 3' away from the edge of the pool wall. 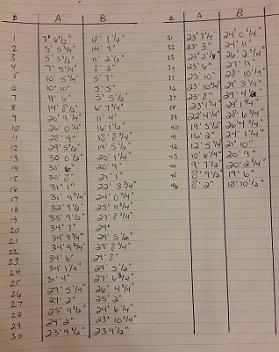 These numbers represent the minimum values however there are no maximum values other than what each individual manufacturer has the ability to work with. By having two fixed points of an exact, known distance apart, a 3-D rendering of your pool can be created. Think of it like a real-life size game of connect the dots. They take the "dots" from two reference points and lay them over top of one another. 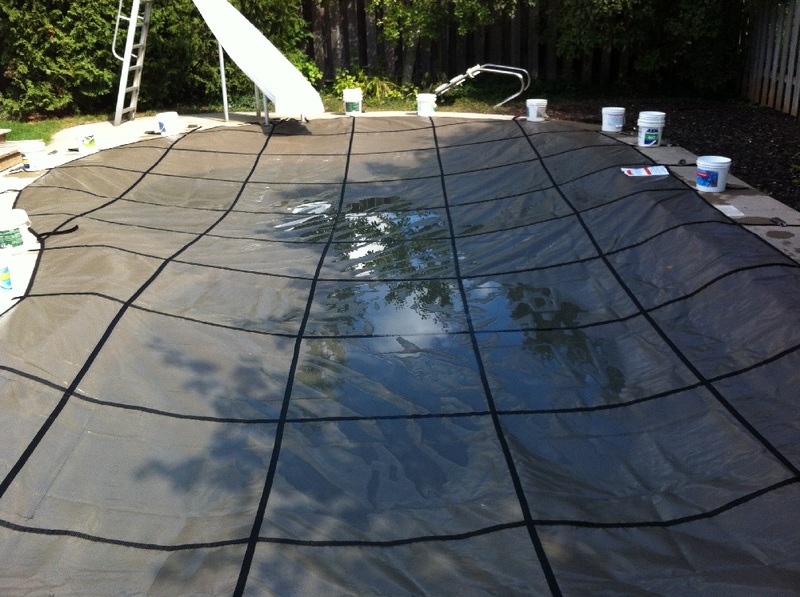 Where these two drawings overlap is the true shape and orientation of your pool. 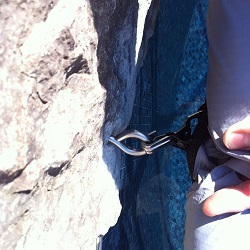 Ideally you would place your two reference points along the long wall of the pool however this is not always possible. Obstructions in the yard like trees, rocks can pose a challenge and you will need to determine the correct place to measure your pool from that is unique to your pool. Each reference point must be able to reach all points around the pool perimeter in a direct, uninterrupted straight line without crossing behind the other reference point! 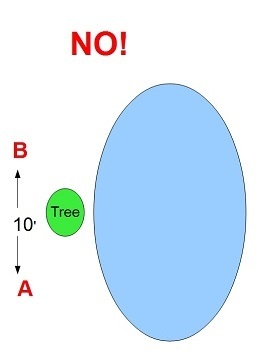 If you set up your A and B reference points in an area where they do not each have a clear line of sight to each area of the pool or such that you will cross to the outside of the other reference point in order to get some of the measurements you need to set up your reference points in another location. 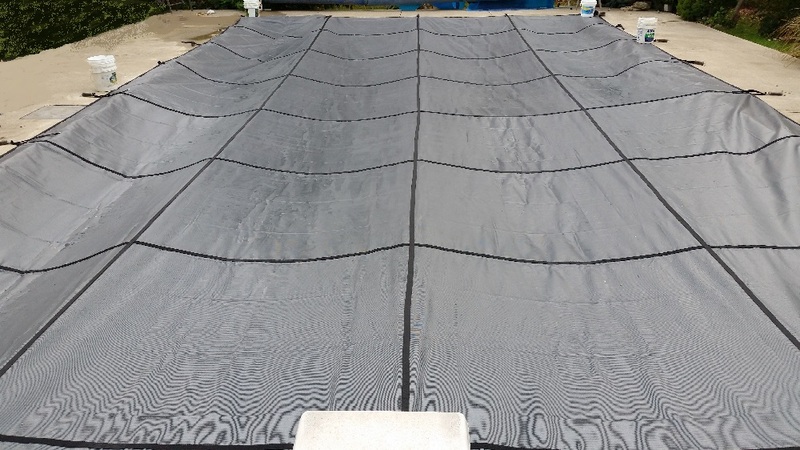 Almost every pool has the ability to be measured with a standard A - B grid however it is possible that due to the layout of your yard this is simply not possible - in 25 years and thousands of liners and cover measurements I have encountered this only one time. 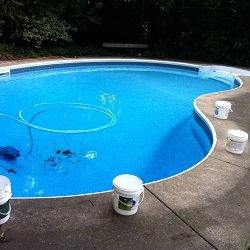 For the vast majority of pools this will be a straightforward process. 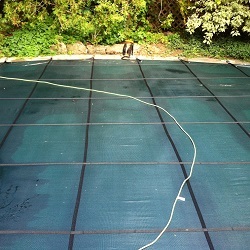 On an average sized swimming pool you will need to mark and measure somewhere between 25 and 50 points around the pool. 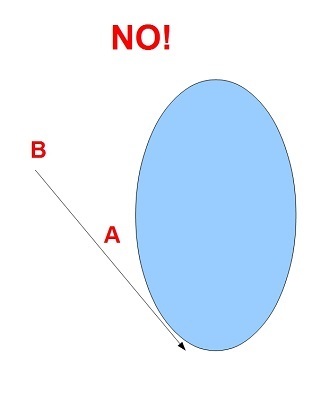 These points should be marked with something temporary like tape, or preferably chalk, and you will measure to each one of these points from both the A and the B reference points. 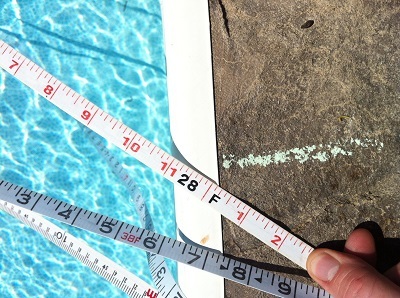 The amount of points you measure around your pool, and the location of these points will depend on the shape of your pool. Much like with a simple connect-the-dots drawing you will be providing "dots" to the cover manufacturer. 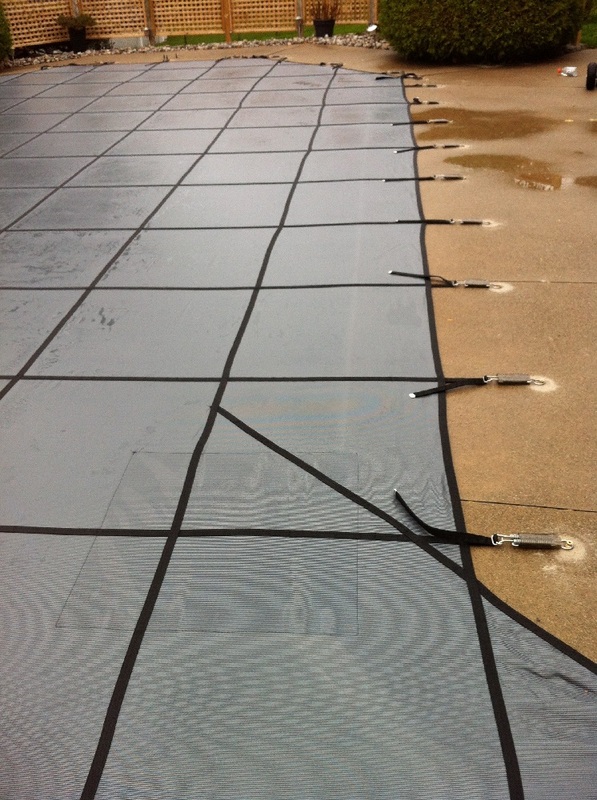 If there is an area on your pool with tight radius bends or uncommon shapes simply add more points around these areas to reduce the likelihood of errors in the measurements. Long straight wall sections can have less plot points than curves and radius bends. As you can see with three examples above there is little mystery in how to plot the points around a pool. The biggest challenge is choosing the location for the A and B reference points - and actually getting the tape measurers to stay where you want them. The spot of choice to put the reference points is in the grass adjacent to the pool if there is any. Simply slide a long screwdriver through the zero end of the tape measurer and push firmly into the ground. Use the first tape measurer installed to stretch out to find the exact location of the second reference point (minimum of 10' away ideally). Securing the reference points to a wooden deck is fairly easy as a discretely placed screw for each tape measurer will not leave any noticeable permanent marks. 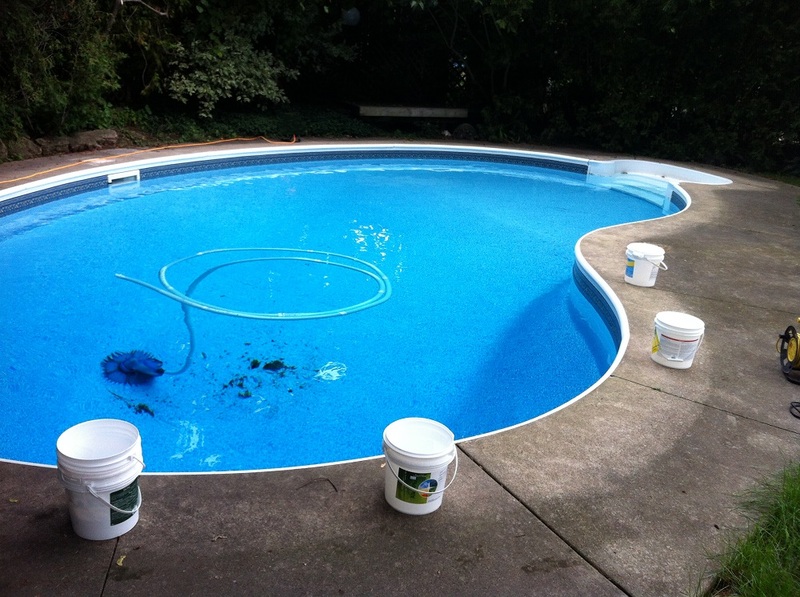 If your entire deck area is concrete you need to try to work with any grass, garden or soil areas that are close to the pool in addition to cracks or expansion joints in the concrete where you might be able to put a screw or nail. The A and B fixed points of reference must be securely attached and remain exactly in position - moving less than 1/4" during the entire measuring process. If the reference points move then you must start the measuring process over again. 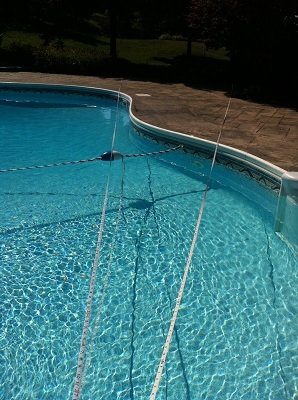 In order to measure an A & B grid for a pool cover you will require two 100' long tape measurers like this one. This style is reliable and easy to use for the purpose. 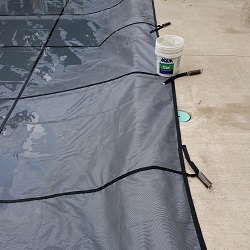 You must use two tape measurers as the measurements for both reference points must be taken at the same time (with accuracy greater than 1/4") so it is not likely you could effectively measure a pool cover with only one tape measurer. Steel tape measurers of any kind are not suitable for this task and the same goes for shorter tape measurers - if you want to install your safety cover yourself then relegate yourself two owning two 100' long flexible tape measurers. 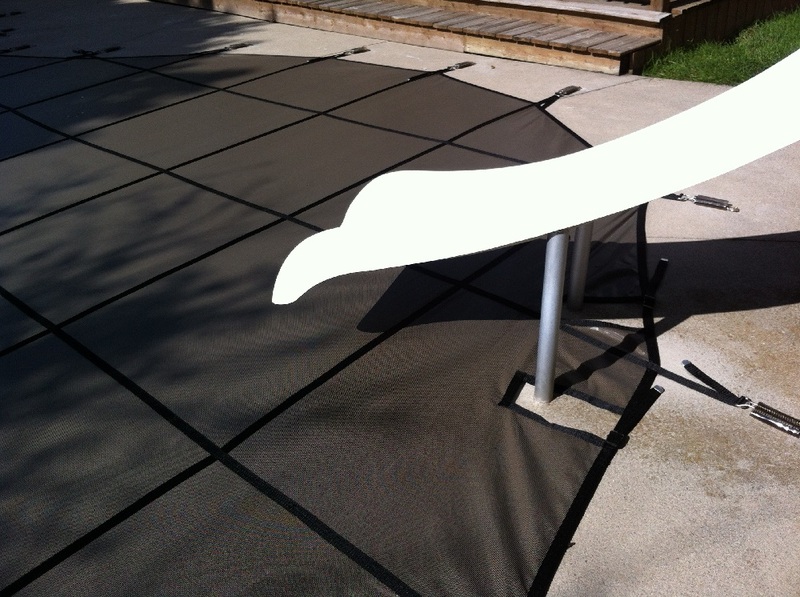 Exclusions - Exclusions are any alterations that the cover needs that are specific to your pool such as a diving board base or slide legs within 24" of the pool wall. In-wall steps are also an exclusion that needs to be measured also but these are included with the regular perimeter measurements. If you have an exclusion such as slide legs then simply take an A and B measurement to the front, center of each and draw these points in on your sketch. The same goes for a waterfall exclusion - simply draw it on the sketch and take additional measurements to this face of the waterfall. 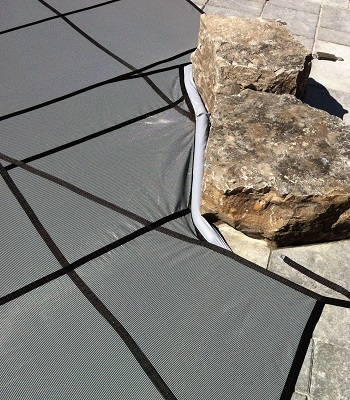 If the waterfall face is uneven simply put your points closer together and give the manufacturer extra measurements. Accuracy is very important with these measurements, to within 1/4" so be sure to take your time and measure carefully. Be sure your tape measurer does not get hung up or twisted and be sure your fixed A and B points will not move when you pull on the tape measurer. In the adjacent picture the measurement would be read as 27' 11" just so long as you read all of the measurements in the same fashion. 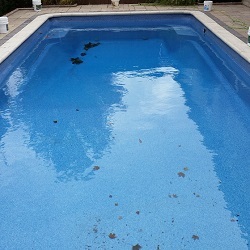 There is a small amount of judgment call needed in measuring these plot points but if you measure to the edge of the pool and measure each mark the same way you should be fine. 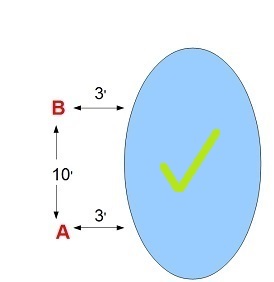 Once you have completed the A and B measurements you need to take a few more individual measurements to give the manufacturer the ability to cross check their dimensions once they have entered your plot points into the CAD program. In addition to 5 or so cross dimensions you should also try to provide overall length and overall width of each section of the pool. These cross-reference measurements are not done with A and B - just measure the distance directly between these points on the pool and include these in the order sheet that you supply to the manufacturer. 1 - 10 = 33' 2 1/4"
1 - 20 = 35' 5"
1 - 30 = 17' 5 3/4"
1 - 40 = 9'9"
W1 - W2 = 18' 0 1/2"
W3 - W4 = 17' 11 3/4"
L1 - L2 = 36' 6"
These handwritten safety cover measurements are just an illustration to show you that measuring for a pool safety cover doesn't need to be complicated. 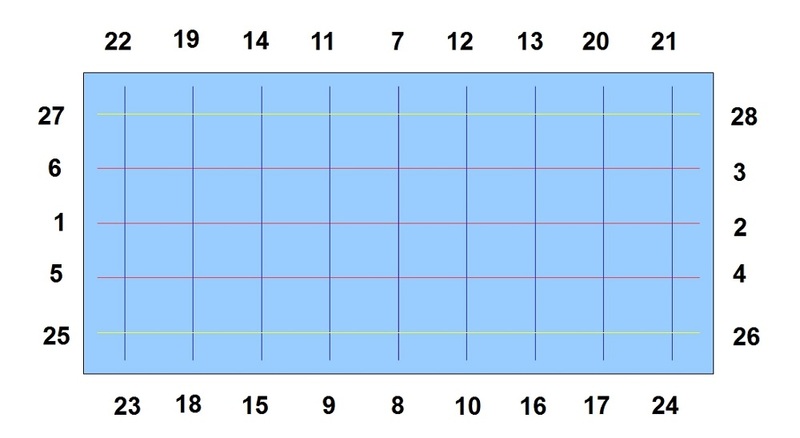 The cross reference measurements that you take need to essentially measure the overall length and the overall width of the pool - you can choose whichever plot points to measure between to get these reference points. 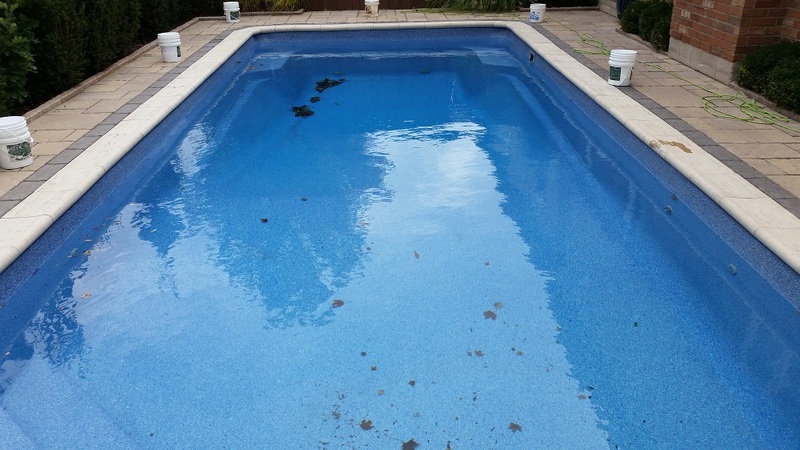 It is important to take note of any permanent obstructions that are on the deck of the pool as you will have to note these in the sketch of the pool as well as take A and B measurements to these obstructions. 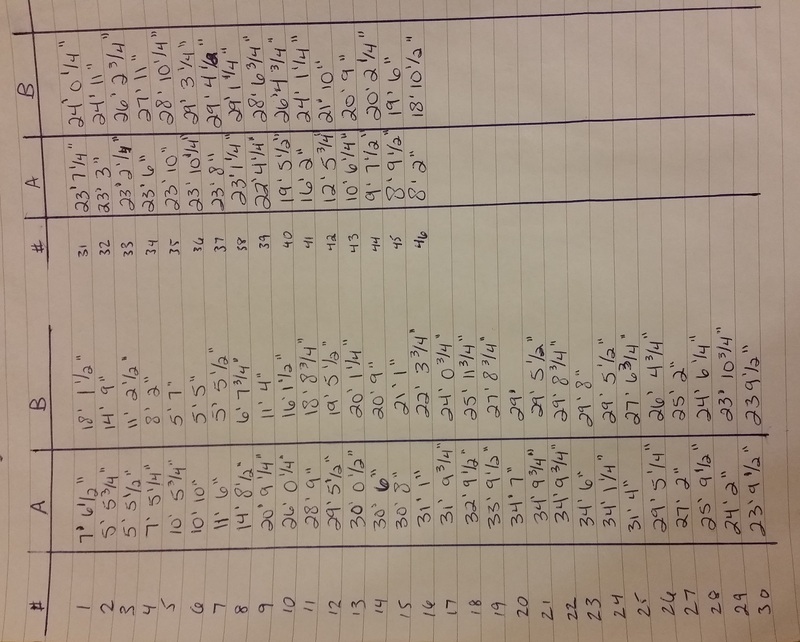 If there is a 6' long waterfall with an uneven face you would mark 6 - 12 plot points on the face of the waterfall and take A and B measurements to these points. Mark these down as W1 through W12 and take a few pictures of the face of the waterfall in case the manufacturer requests more information. In addition to taking A and B measurements you should also take a few linear measurements of the waterfall such as the total width and total length. 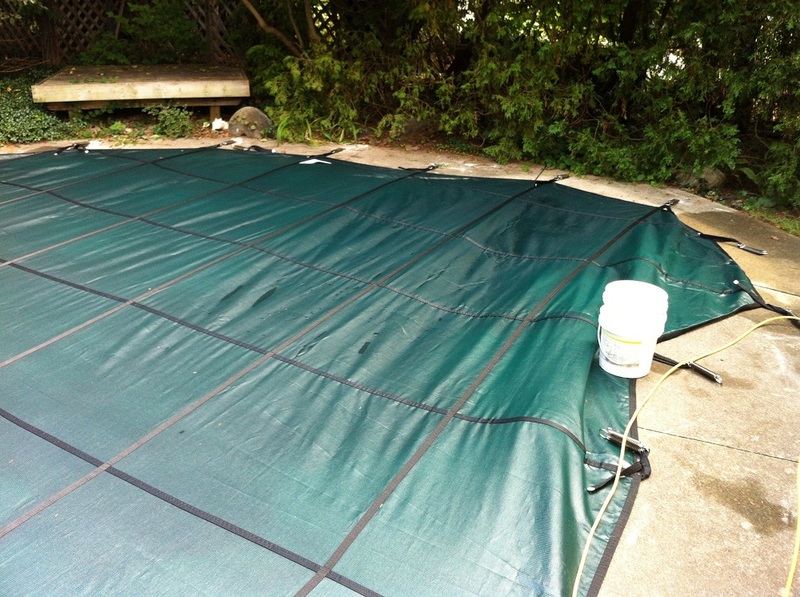 Too much information is better than not enough when it comes to custom fitting a safety cover to your pool. 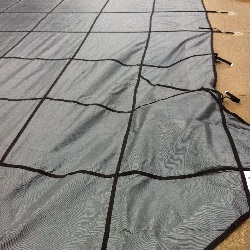 Cover thickness - As detailed above most safety cover manufacturers will have a thin mesh, a thicker mesh and at least one version of a solid safety cover. 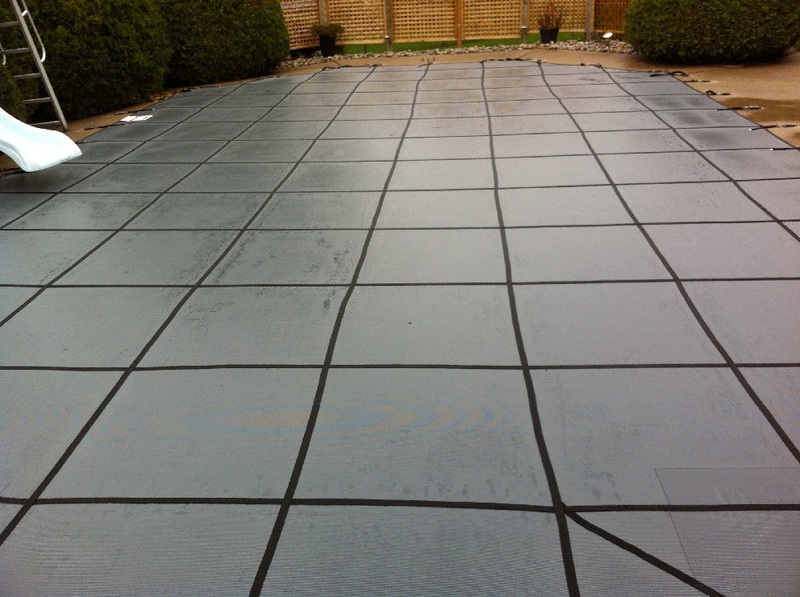 Grid size - Grid size refers to the size of the cover grid panels which is usually 3' and 5' (roughly). 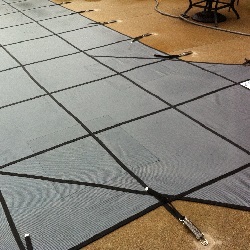 A 5' grid safety cover will have less straps (and less holes in the deck) than a 3' grid safety cover. 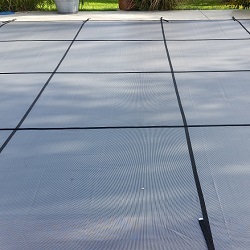 A 5' grid cover would cost a little less money than a 3' grid cover however the larger panel sections can allow for a little more sag in the cover. Most custom covers will require a 3' grid spacing, without an option for 5', but simple shapes like rectangles will have the choice between the two. 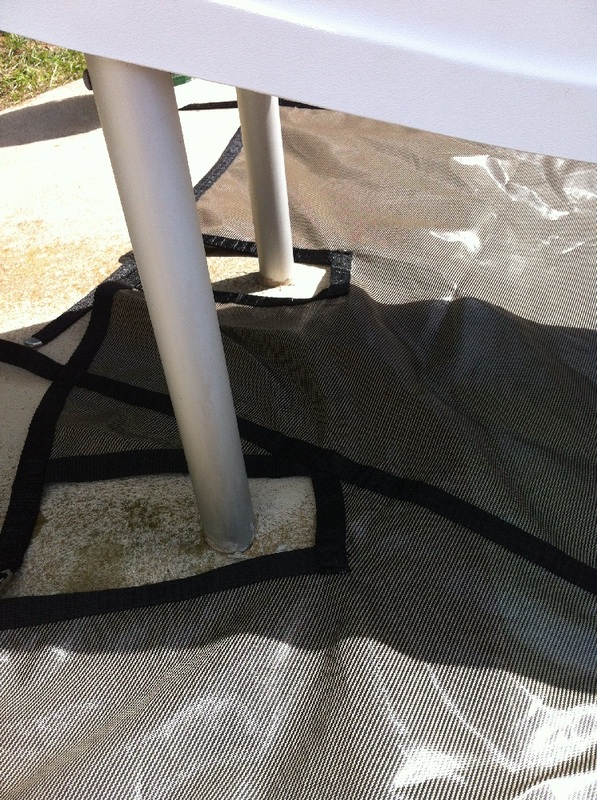 Pool steps - If you have a set of pool steps there will be a small upcharge for an extra flap to cover this area also. Simply measure around the stairs as part of the perimeter plot of the pool measurement and include the shape and orientation on your sketch of the pool. 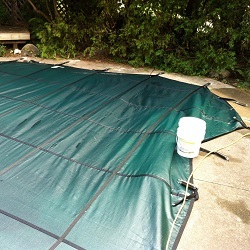 Reduced deck mounting - Usually 3' of deck area around the pool is required to install a cover. 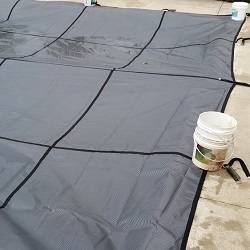 If there is less than this amount then you can order the cover with additional straps installed that lets you drill the grommet right at the edge of the cover instead of 12-24" past the edge of the cover. 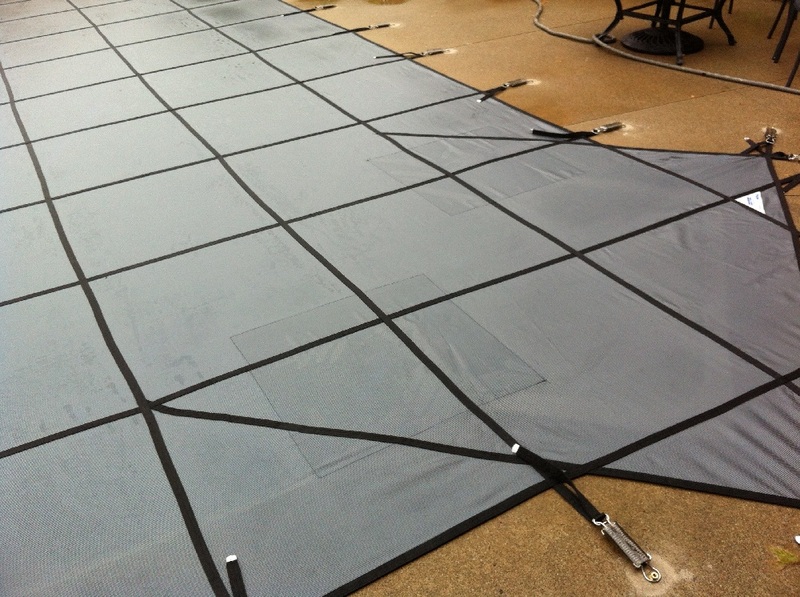 Itemize limited deck space on your pool sketch and note it referencing the A - B plots (points 12-20 require reduce deck mount straps). 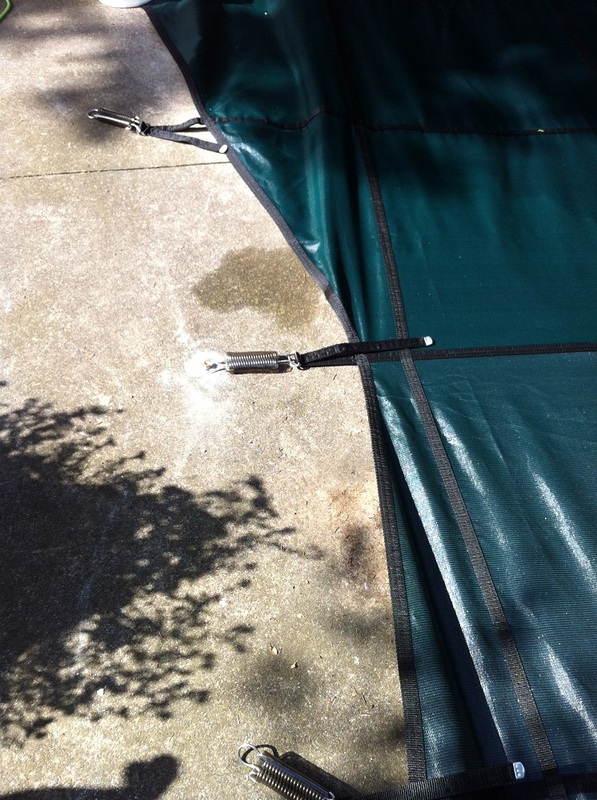 Padding - There are two types of padding available on safety covers. If you have a waterfall where a cutout will be you can add padding to the cutout that is similar to a pool noodle sewn into the edge. 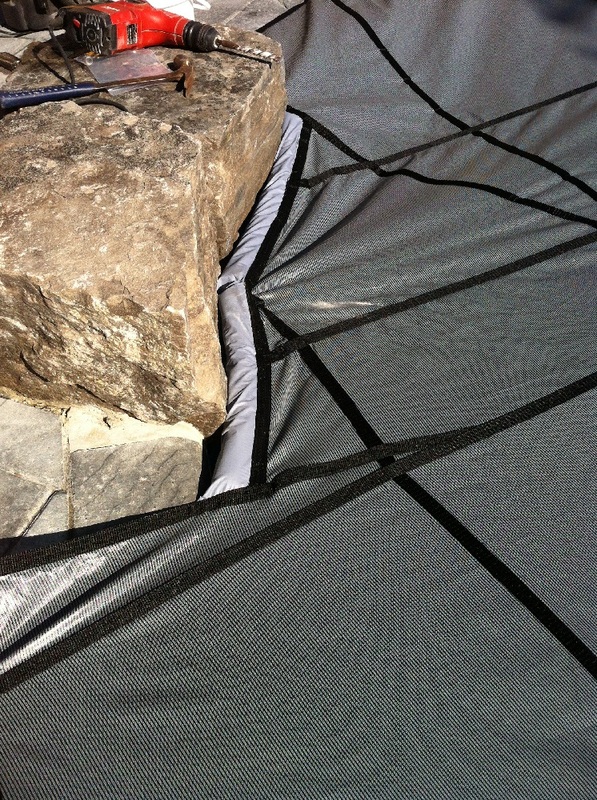 This padding helps to achieve coverage of random shaped waterfalls and prevent unsightly and potentially dangerous gaps at these locations. 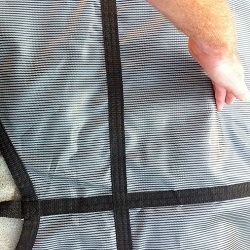 The other type of padding is a rub pad on the underside of the cover that can be sewn in to prevent damage from rubbing. 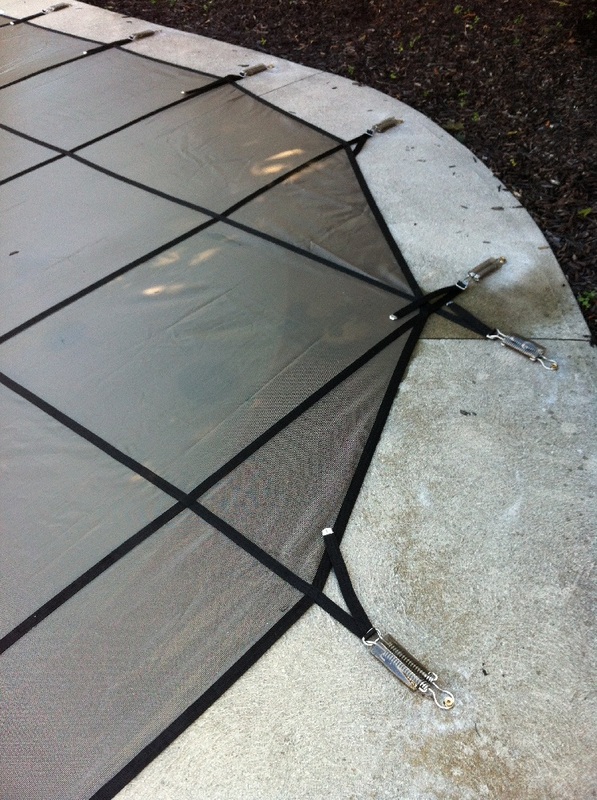 These are important to have in any place where there is a sharp edge on the pool deck. 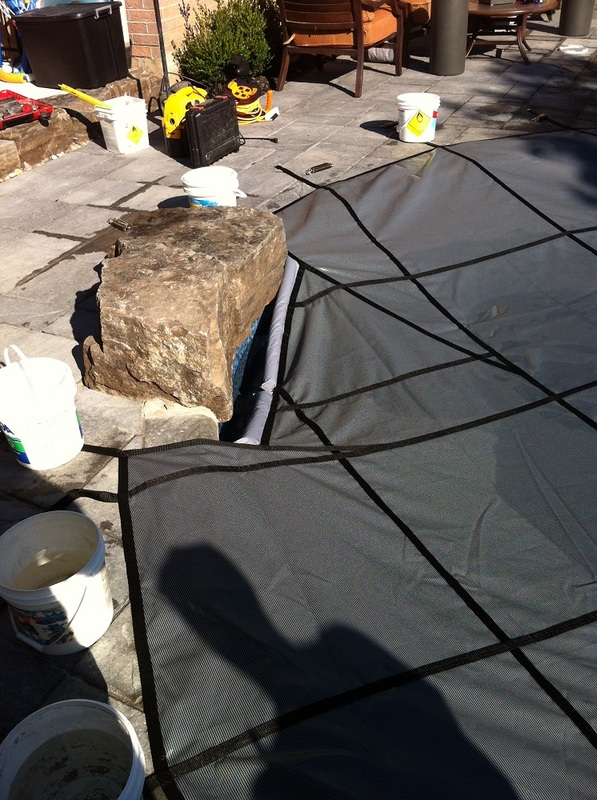 Corners of steps, sharp interior radius and pool decks and coping with sharp stone edges should all be protected with underside padding. 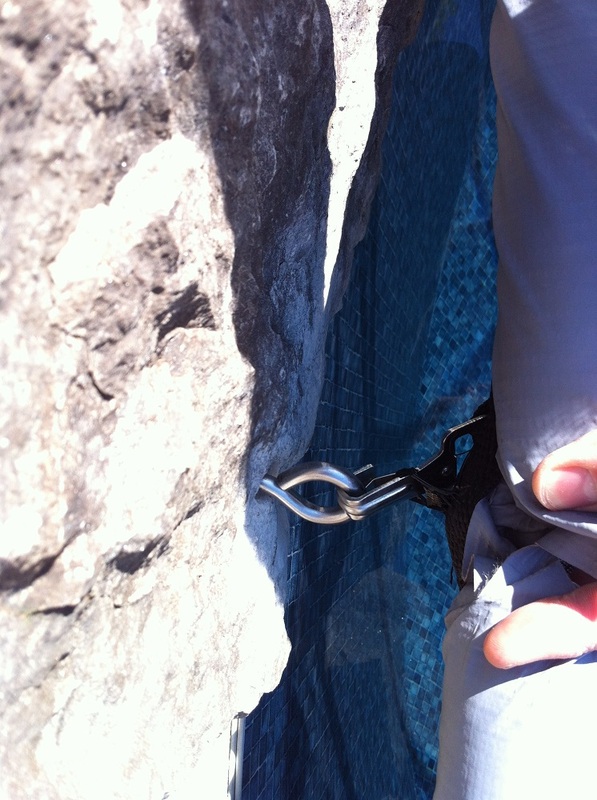 Waterfalls - If you need a cutout for a waterfall or diving rocks this will usually also require you to drill into the face of the waterfall and attach anchors - which can be challenging. Some manufacturers have a cable system using aircraft cable while others use heavy duty hook and eye anchors. Taking a few pictures of your waterfall will go a long way in helping the manufacturer determine how to make your cover in these areas. 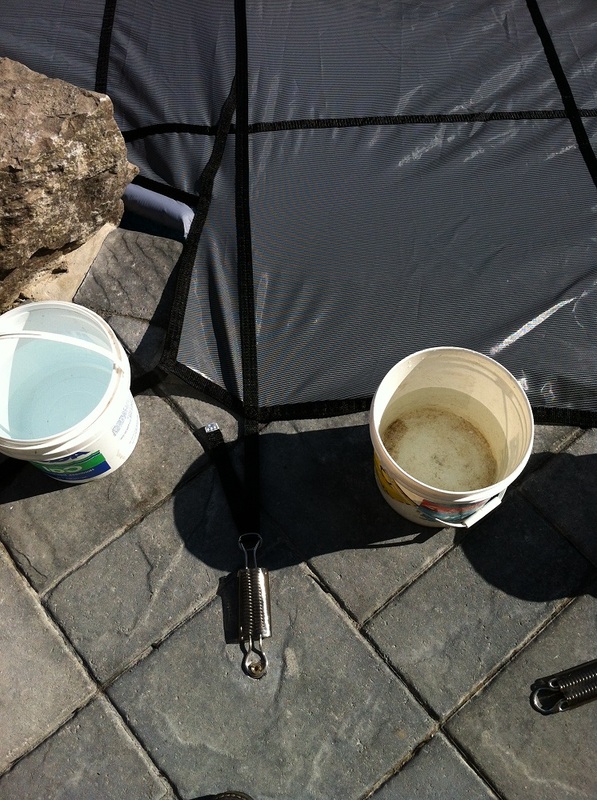 If you are installing your own pool cover you will require some construction tools. 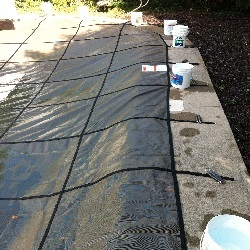 Having the right tool to do the job is very important as this will ensure a quality, safe, installation of your cover. The tools needed for installing into wood decks are the least expensive and lightest duty followed by concrete pool decks next. 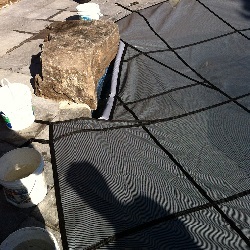 Installing into interlock or paving stones requires fairly heavy duty equipment by comparison to the other two. 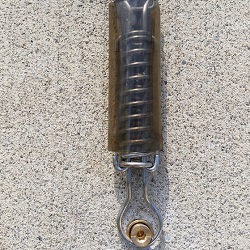 Brass concrete anchors, which are the standard for installing into concrete pool decks of all kinds, require a 3/4" masonry drill bit from almost all manufacturers. While the hole itself will only be drilled just over 2" deep, buying a longer drill bit can help your back out as you will be drilling between 25 - 50 holes into concrete. 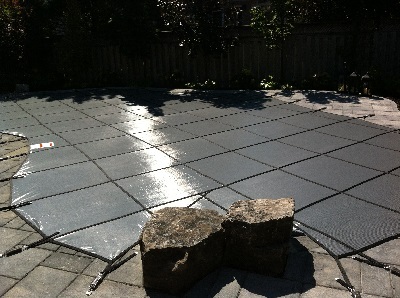 Interlock and paving stone decks are either set on compacted screenings or onto concrete. This drill bit is a 1" SDS Max Shaft as you will need a very powerful drill for this. Unlike the concrete anchors, the interlock stakes require holes to be drilled over 12" in depth - and a larger diameter than with the concrete anchors. Some manufacturers use 1" stakes however some use 7/8" Drill Bit size so be sure to check with your manufacturer. If your interlock is not installed over concrete then you might be able to get away with a less powerful drill though the larger SDS model is recommended. If you want to try to use a smaller 1/2" shaft hammer drill then here is the 7/8" Bit and the 1" Bit for smaller hammer drills. This is a SDS Plus Hammer Drill with the smaller style shaft that receives the smaller of the two drill bit sizes. This is the size of hammer drill that would be suitable for concrete deck installations of covers. If you are installing interlock stakes into relatively soft ground (not interlock over concrete) then you might be able to get away with this size drill for the larger and deeper interlock stake holes - but the SDS Max size drill is certainly recommended. This is a hammer drill with the larger SDS Max shaft size for the larger style drill bits. 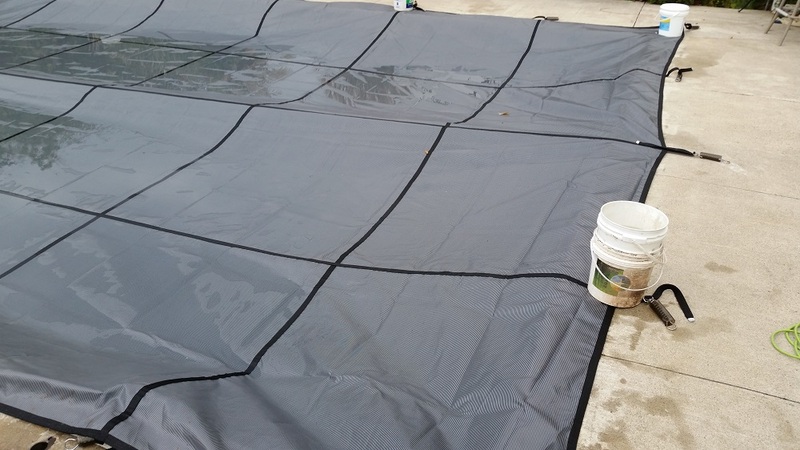 This drill is smaller than what pool contractors use for this purpose however you only need to install one safety cover where we need to install hundreds. The typical hammer drill size for installing interlock stakes into pavers over concrete would be the 2" SDS Max Rotary Hammer Drill . While this information is for reference you may find it more cost effective to rent the tools that you need to install your safety cover from your local hardware store. Many will also have drill bits for rent as well making this a good option if available to you. If you have to buy the drill to install the cover then at least the cover is still going to cost less than having a professional install it - plus you get to keep the new drill! 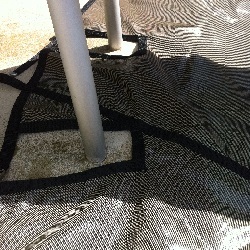 When it comes time to install the cover there is surprisingly little magic involved. 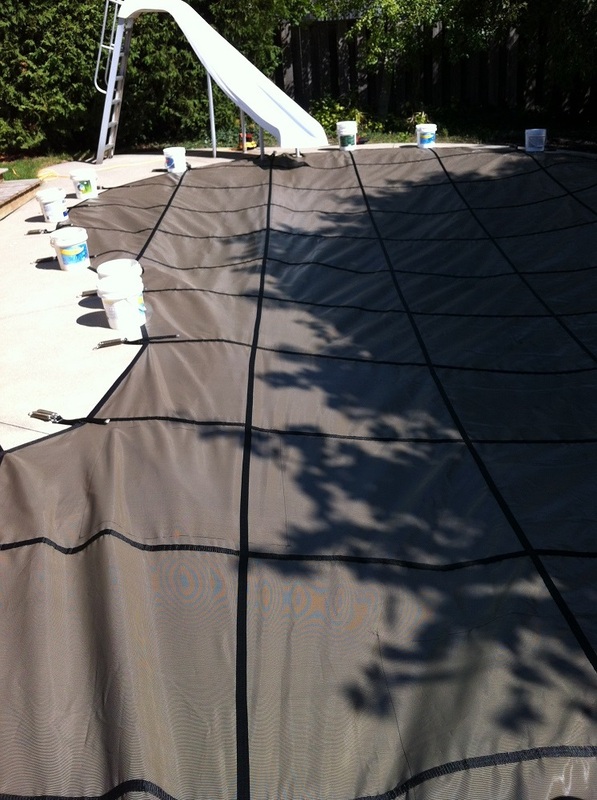 The process starts with laying the pool cover over the pool and holding it in place with buckets filled with water. You will need anywhere from 12 - 24 buckets in total. 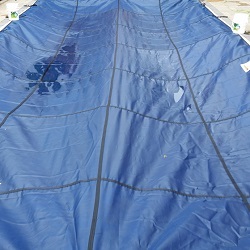 The cover will have the tendency to float on top of the water and you use the weighted buckets to sit on the straps which will allow you to stretch the cover out in every direction. 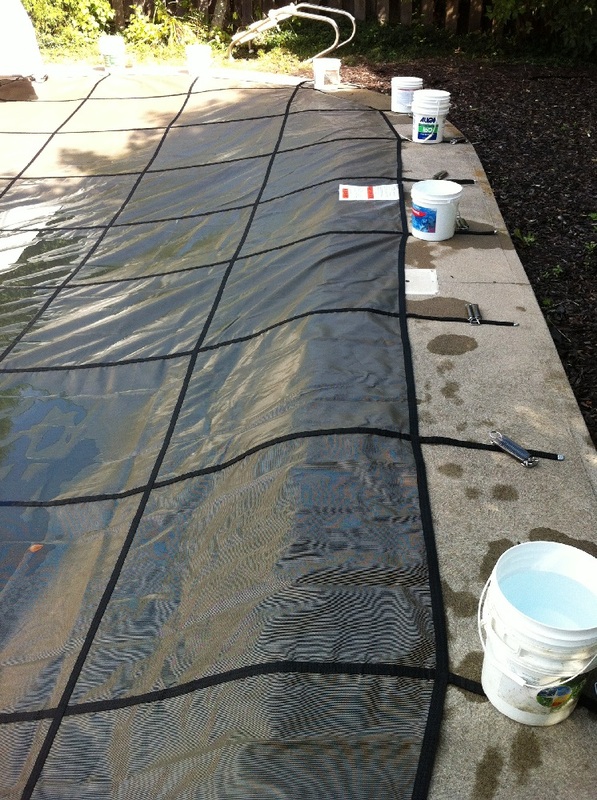 This process of laying out the cover is one of the very most important parts of the cover installation. The very first two holes that you drill will dictate the final orientation of the cover and the better you stretch the cover into place, the less guesswork involved with drilling those first two holes. 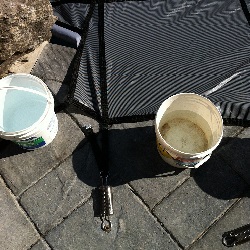 Layout the cover and secure with buckets. 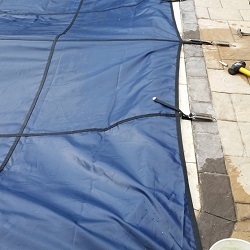 Take you time to ensure that the cover is oriented equally on all side of the pool and start by drilling the long strap down the center of the pool. Attach springs onto each strap of the cover at this stage - every cover will come with instructions on how to attach the springs since there are a few different manufacturer styles available. 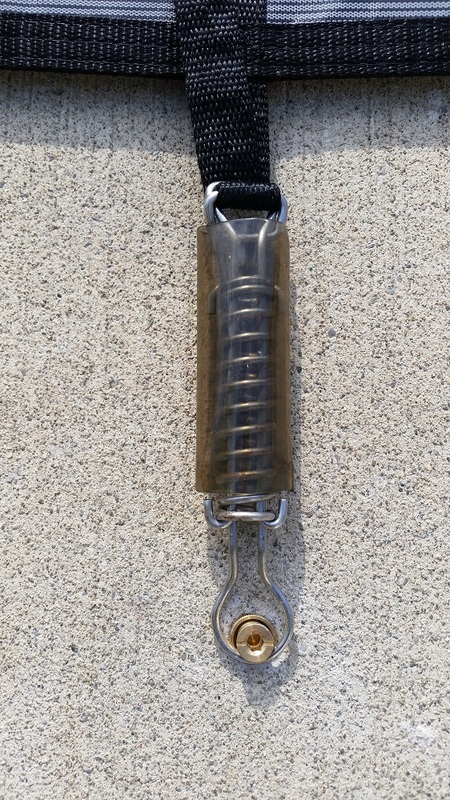 As a starting point leave about 6" to 8" of strap before the spring as this will give you some room to adjust the spring tighter or looser as needed. 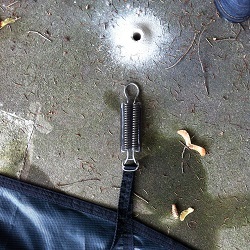 With the spring connected to the strap you want to drill the first two holes 12" away from the end of the spring, possibly even more, to allow for all of the slack hanging down onto the pool surface. After the cover has less slack on it you can drill the holes closer to 6" to 8" from the end of the springs for the remaining holes you drill. Once you have drilled these first two holes there is only a small amount of adjusting of the cover you will be able to do - take your time here to get the best orientation possible! After the first long strap is installed you will then drill the long strap holes on either side of this middle strap. By continuing to alternate back and forth like this you will always be working the cover installation towards the corners. 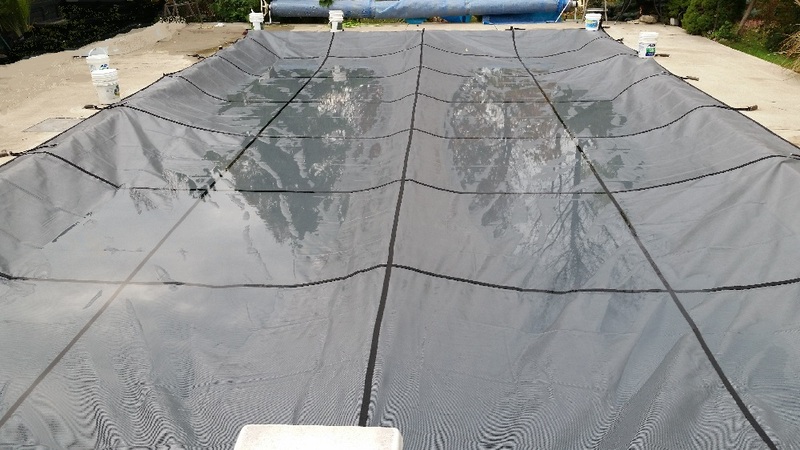 Once you have the main lengthwise straps installed (between 3 to 5 straps - 6 to 10 holes total) you need to switch to the widthwise straps starting with the center of the pool and working outwards from there. 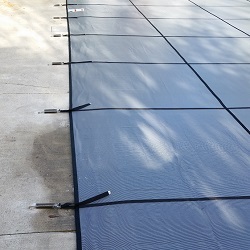 Similar to the first lengthwise straps you want to alternate sides on the pool as you drill the holes and connect the cover. 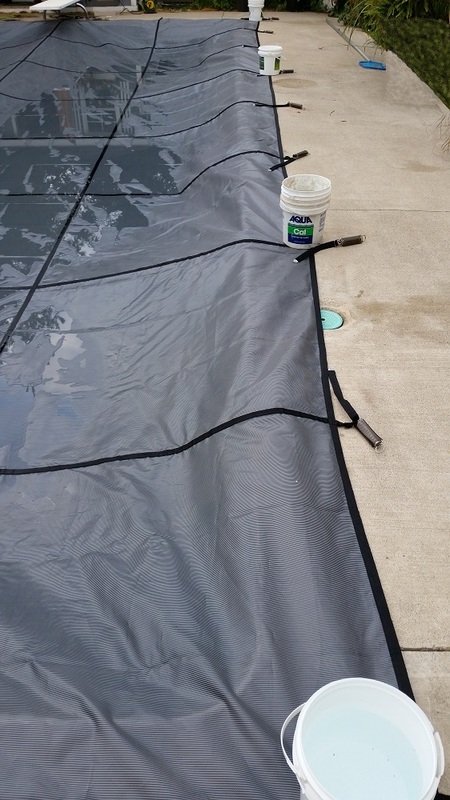 Regardless of the shape of the pool this is the general process that you should follow when drilling the holes for the safety cover. The only time that you would vary from this method would be to compensate for an exclusion of some kind such as slide leg cutouts or a waterfall cutout. 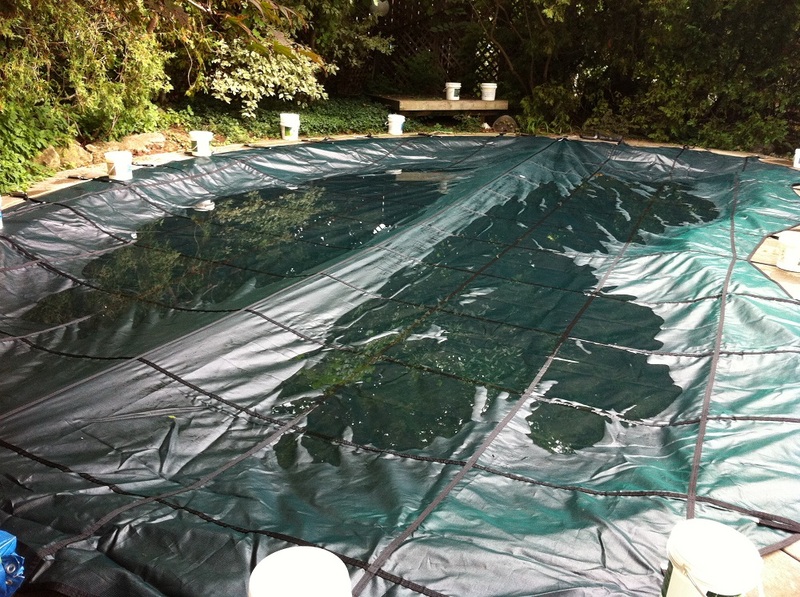 Since a cutout can really only go in one spot and even a few inches one way or another may cause a permanent wrinkle in the cover you might benefit from starting from these fixed locations if your pool has these. By starting with the fixed location of your waterfall or slide cutout this ensures the best possible fit in these locations. 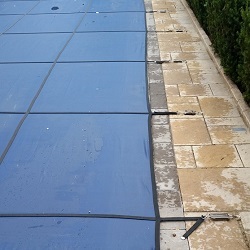 The cover overlaps onto the pool deck anywhere from 12" up to 24"+ so there is a small amount of forgiveness to have it shift one way or the other. The openings for slide legs or waterfall cutouts are very small and much more difficult to orient successfully if you do not start with them first. 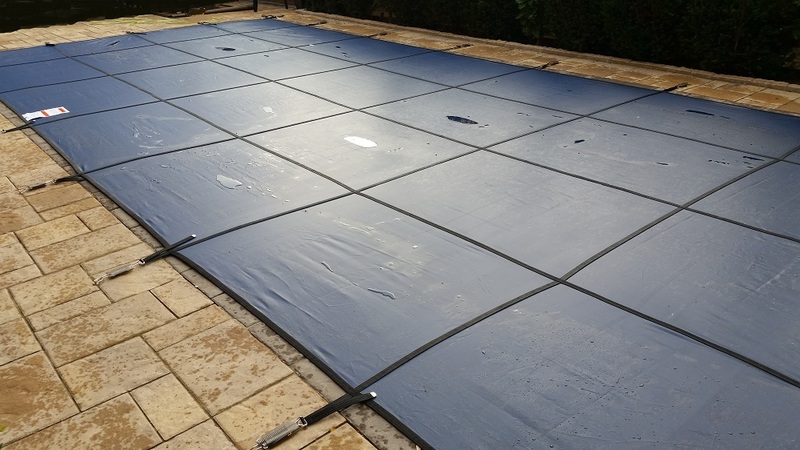 If you have a rectangle shaped swimming pool then installing a safety cover is a very easy process - more so than with any other shape of pools. The layout is very easy since all you need to do is make sure that you have even and equal spacing on all sides of the pool. 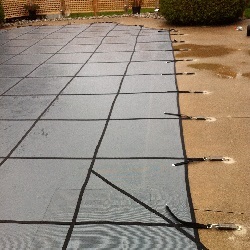 If you have the same amount of cover overlapped onto the pool deck on all sides then you are sure to have a perfect orientation once you drill the first two lengthwise straps. 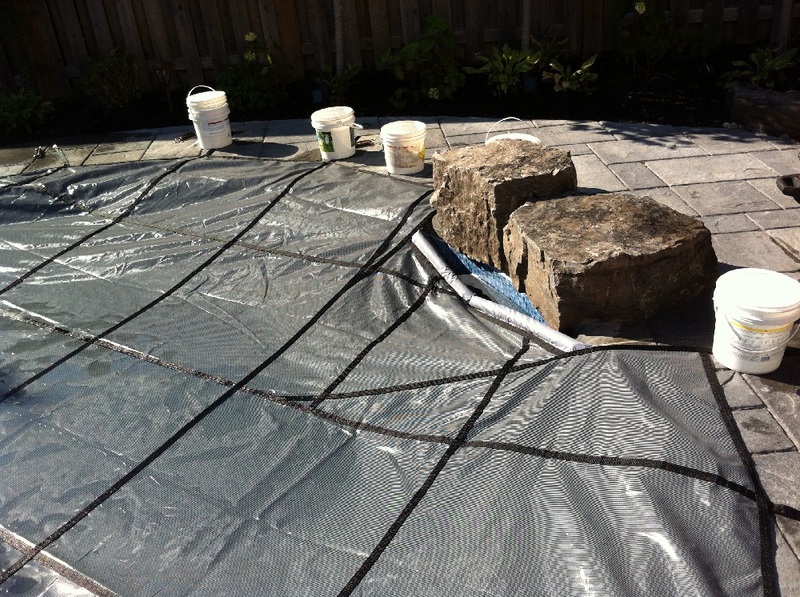 When installing into an interlock or paving stone deck ideally you want to install the stakes into the joint sections where the stones meet. 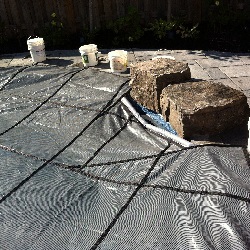 While you can install directly through interlock stones there is a chance the stone will crack. If the interlock stake enters the ground at even a slight angle this can put pressure on the side of the stone and chipping or cracking can happen. When installing into grout joints it is likely that there may be some movement in the brick which can break the grout joint as pictured. This would be considered normal for installing into an interlock deck and re-sanding will minimize the look of the shifted stone. 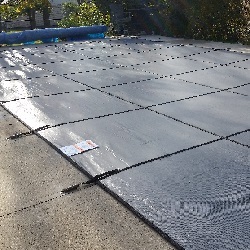 If you have a diving board on your pool there are a few different ways to work around this when installing a safety cover. 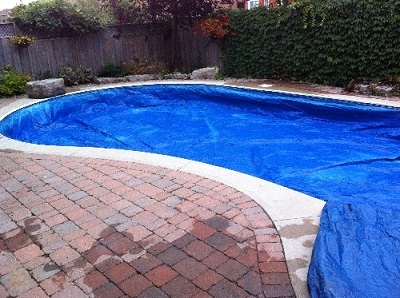 Some pools have diving boards that they take off for the winter in which case just install the cover as per normal. 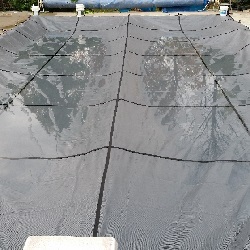 More commonly, diving boards are installed when the pool was built and never come off - and this can be a problem for you if one of the straps from the cover lines up with the diving board. 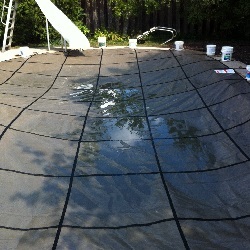 You certainly do not want to need to take the diving board off every year just to facilitate putting on the cover. 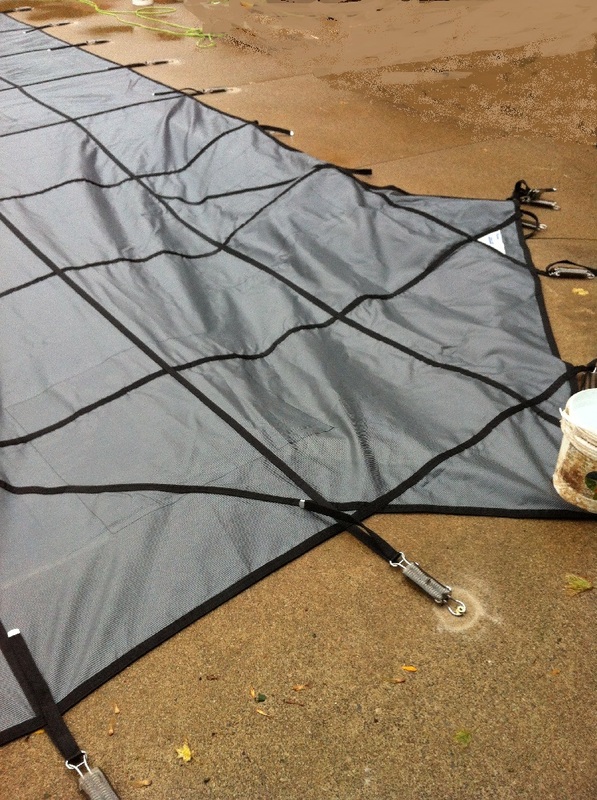 If you have a diving board then you should request a diving board "Y" strap from your cover manufacturer. 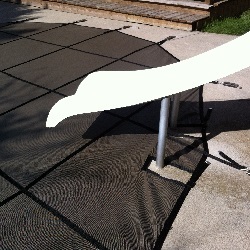 To do this simply add the diving board onto the pool sketch for your cover order and write next to it " send "Y" strap. 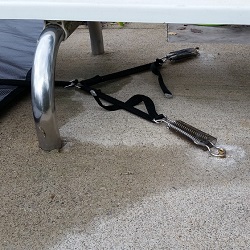 A "Y" strap allows you to install a spring and grommet on either side of the diving board instead of a single one under where the diving board is. 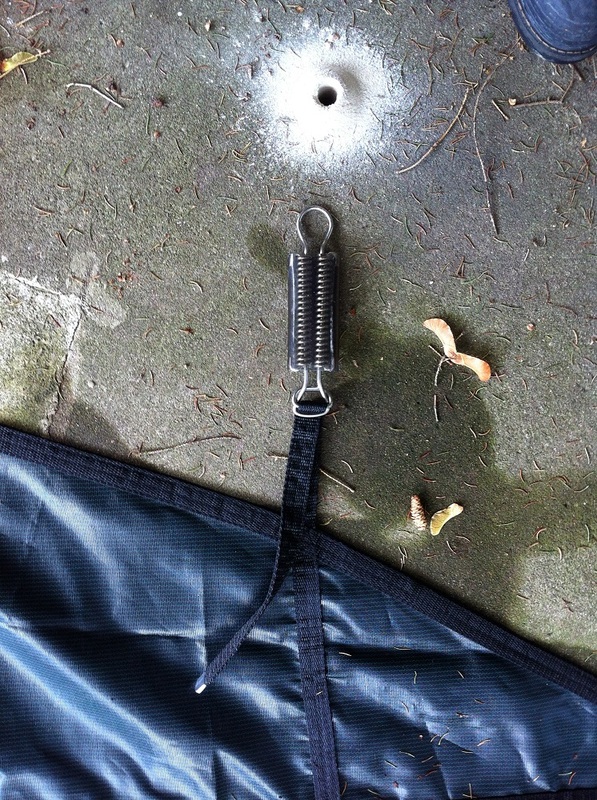 This quick and easy workaround simply requires one more grommet and spring than a regular cover - plus the addition of a D-link or connector and a fabric strap. 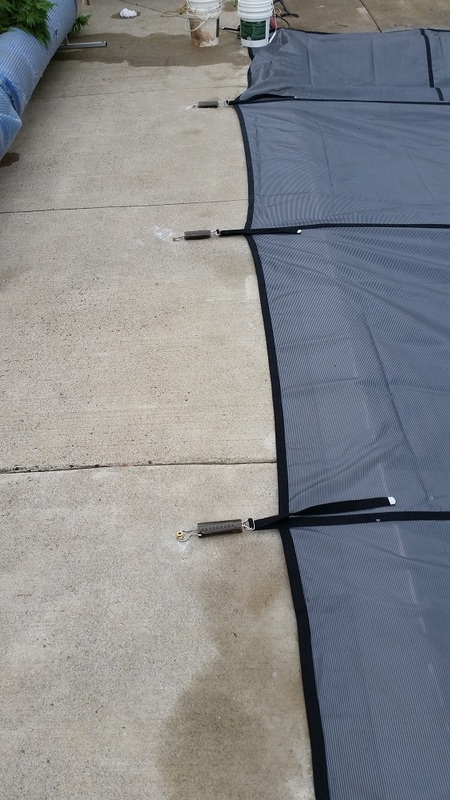 These covers come including brass grommet inserts for installation into concrete pool decks of all kinds, a hex key grommet tool, a cover storage bag, the installation bar and heavy duty stainless steel springs with plastic sleeves. 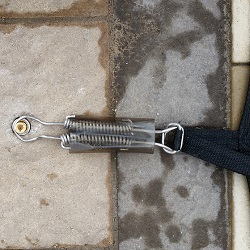 If you are installing into interlock or paving stone decks you will need to order paving stone & interlock stainless steel or aluminum grommet stakes. 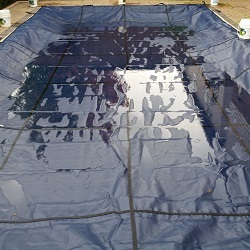 If you have a rectangle pool without steps then this is a great cover option available to order online. These covers are available in blue and green in color. 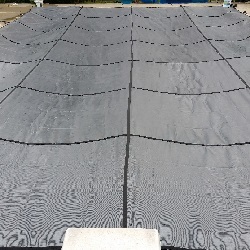 If you have a set of in-wall steps in the center of your shallow end wall then this is the safety cover that you are looking for, also available in blue and green. 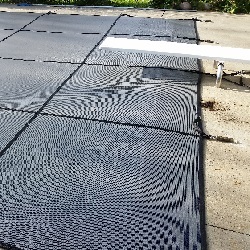 If your rectangle pool has right side steps on the shallow end you are approaching the point where a completely custom pool cover will be required. 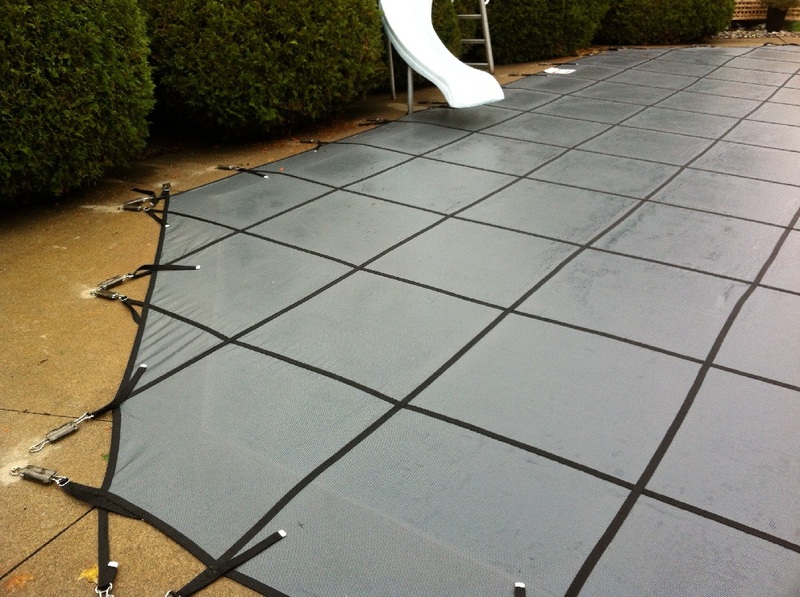 Here are a few manufacturers that offer off-the-shelf safety covers for pools with side steps on the shallow end. 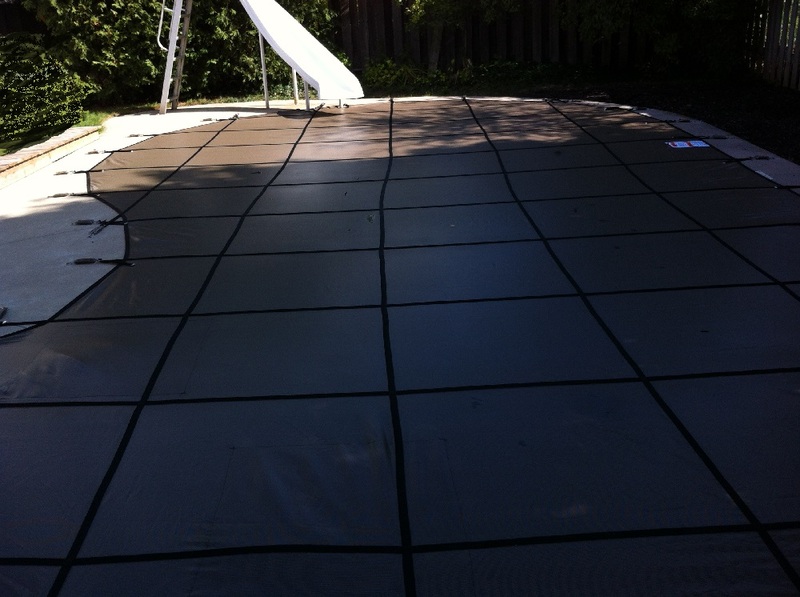 If you have a rectangle pool with left side steps these are the online safety cover options available for your pool. 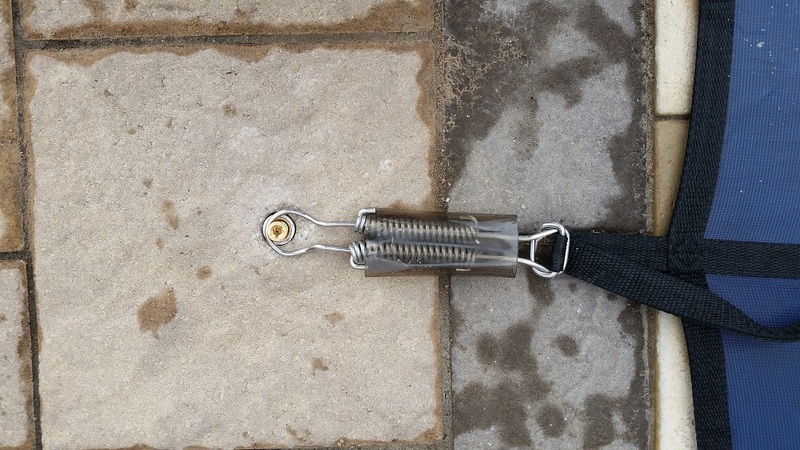 If you are installing your cover into a paving stone, natural stone or interlock stone deck then you will need to purchase these interlock stake tubes that will drive down into the ground and prevent the force force from the cover from lifting the stones. 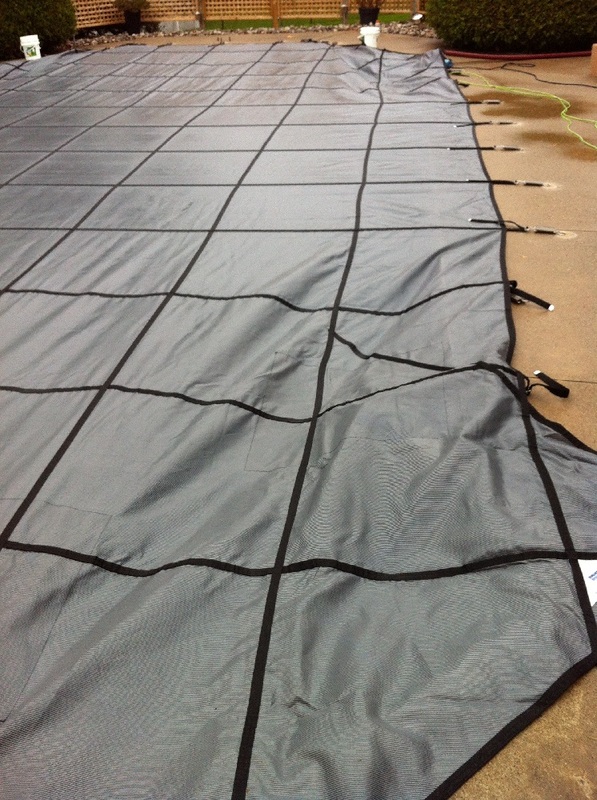 These are 18" long and come in a package of 3 - and you will need an anchor for every strap that your pool cover has. For pool safety cover installations into lawn, grass, garden or dirt decks then you will require these Aluminum Lawn Stakes . 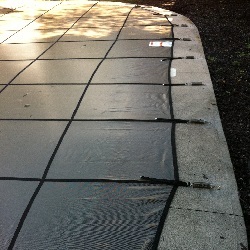 This style of cover stake is designed to be installed sloped away from the pool (as opposed to straight up and down like other cover anchor types) which allows the lawn stake to be straight up and down once the cover is under tension. It is common to need to reinstall these stakes into the ground yearly as they will be loose after a snow load on the cover. 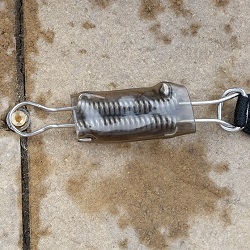 This is a package of 10 replacement brass Anchors for Pool Safety Covers which is useful if you have a cover that is older and some of the grommets are starting to fail - you can replace the heads or drill a new hole adjacent to the old hole. These brass grommets are also what are set into stainless steel or aluminum tubes to make the interlock stakes for installations into paving stones. 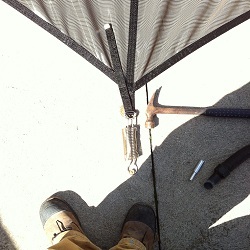 After you drill the concrete grommet anchors into the deck you need to tamp the anchor into place. Since the anchors are made from brass you can not hit them directly with a hammer as you will crack them or cause them to become misshapen. 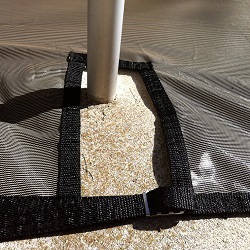 This Pool Safety Cover Anchor Tamping Tool works with both concrete and interlock stakes. For installing a safety cover on a pool with a wooden deck you will require these Wood Deck Anchors For Pool Safety Covers . 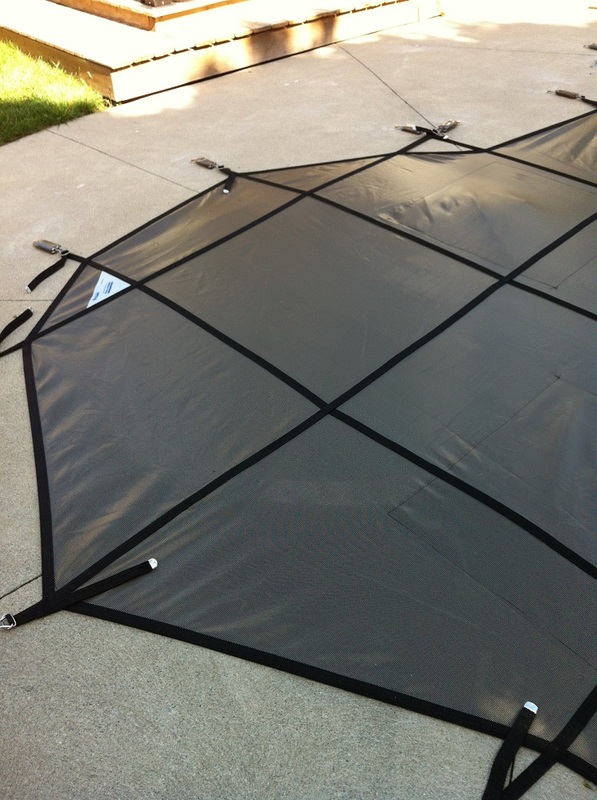 These come in a pack of 10 and you will need one for each strap that your pool cover has. 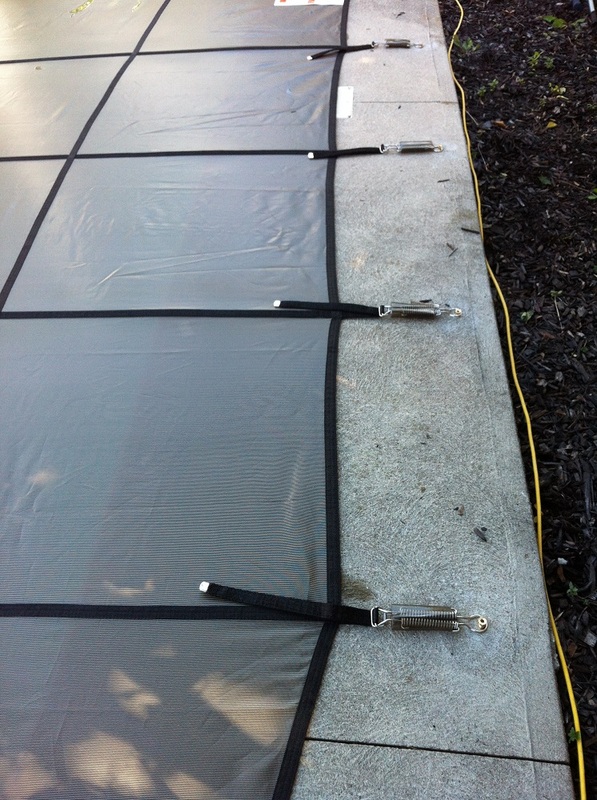 If you need to order replacement springs for your pool this is a 5 Pack Of Safety Cover Springs . If you only require a single spring you can also order a Single Cover Replacement Spring . This style of spring requires a Stainless Steel Buckle which might be different than your current spring style so be sure to order these buckles as well. 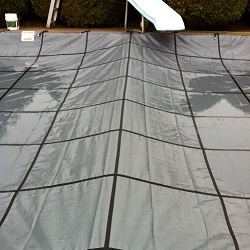 Some brand of swimming pool safety covers do not require buckles in order to connect the spring to the cover however many do. These are replacement Stainless Steel Buckles for pool safety covers - these work on any manufacturer straps that are 1" in thickness or less. 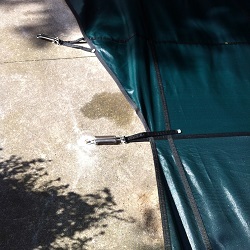 Putting the cover on and taking it off the pool requires the use of this leverage bar with a notched end. This allows you to put the cover springs under tension without risking any of your fingers in the process. If you have lost your install bar then order another - you can't properly install the cover without one. 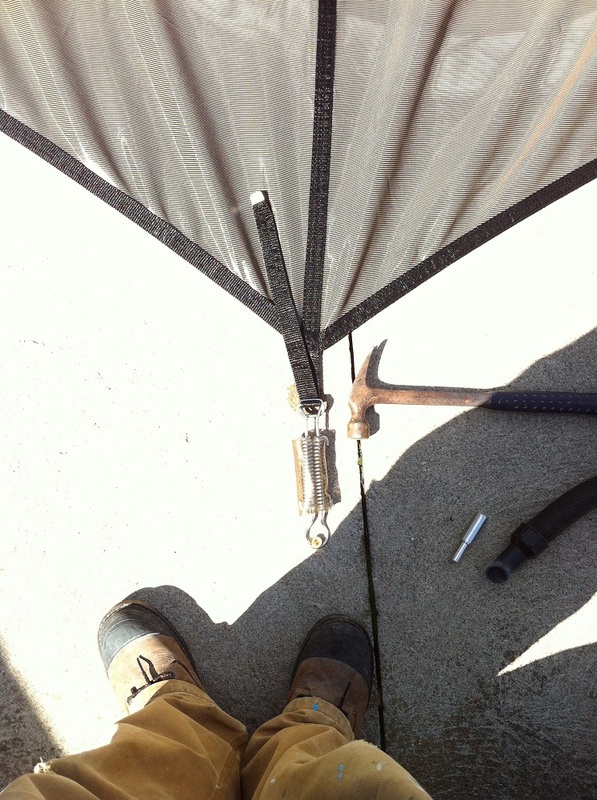 For raising and lowering the grommet heads you will need a Safety Cover Hex Key . Another option for raising and lowering the grommet heads is to use a cordless drill with a screwdriver bit - simply turn any standard screwdriver bit around backwards in the drill and this is the exact size of grommet hex heads. It is very common for the grommet to cause chipping, scarring or cracking to the deck area immediately surrounding the head of the grommet. The skill of the installer, the age of the concrete and the age of the drill bit all will be contributing factors to chipping. 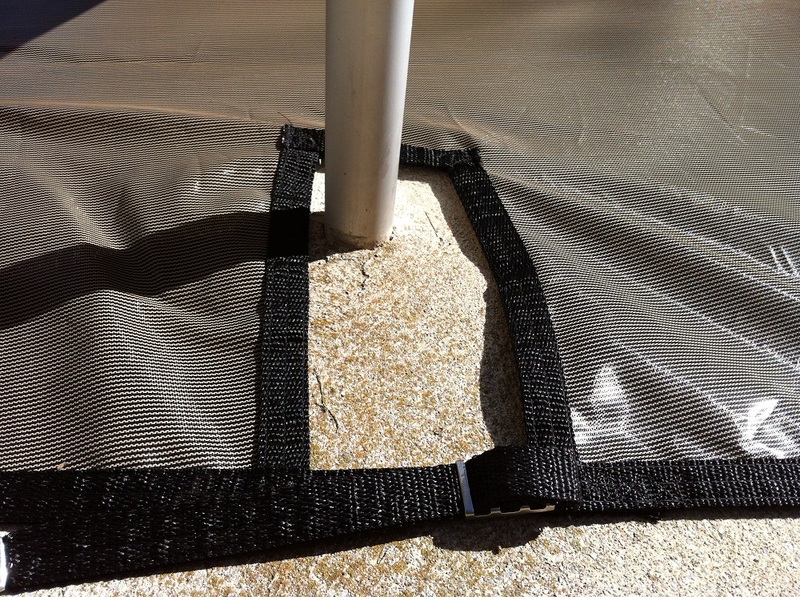 If your pool deck has a problem with this, or if you just want to make sure you pool cover looks as good as possible then consider adding these Safety Cover Anchor Collars to your pool. These come in sets of 10.